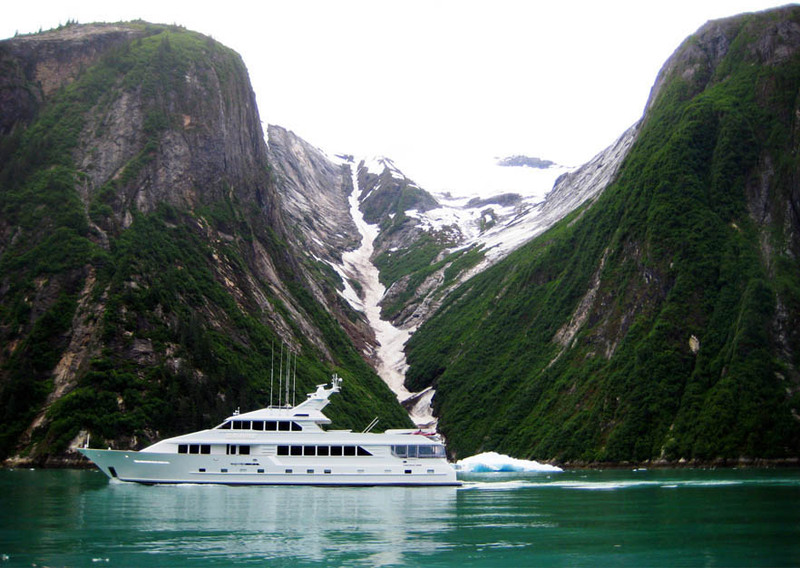 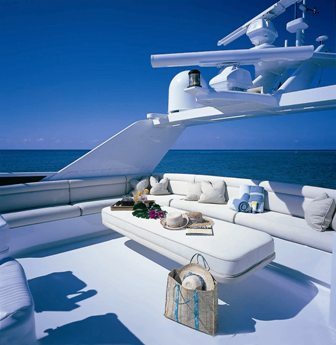 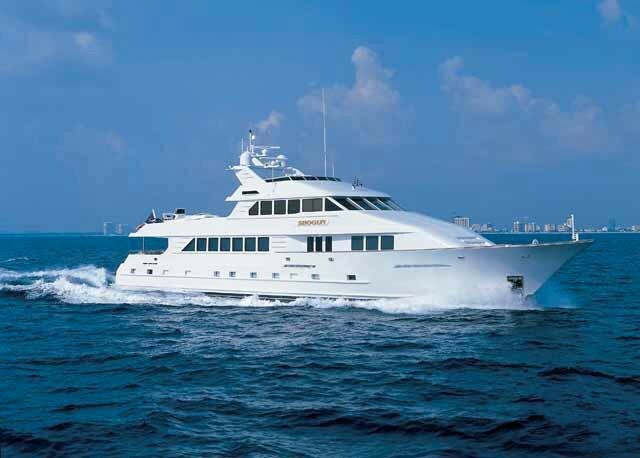 Luxury motor yacht SERENITY (ex Talos, Shogun) is a 37,19m (122’) charter yacht built by Flagship in 1993. 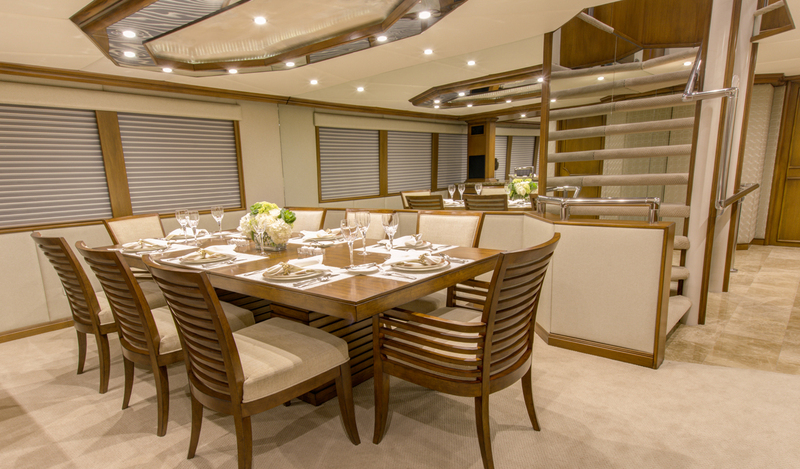 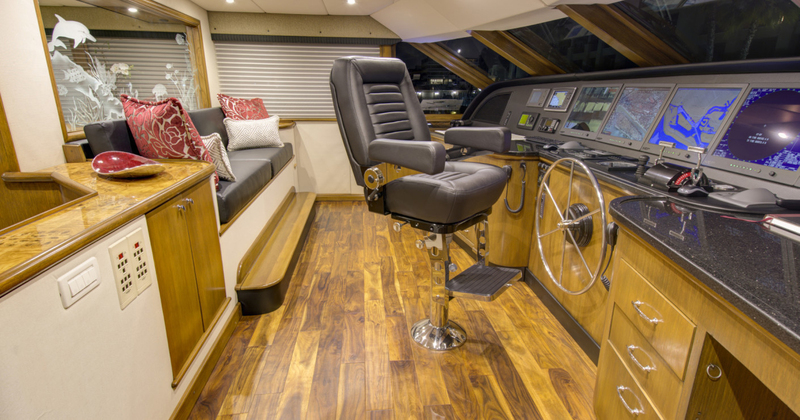 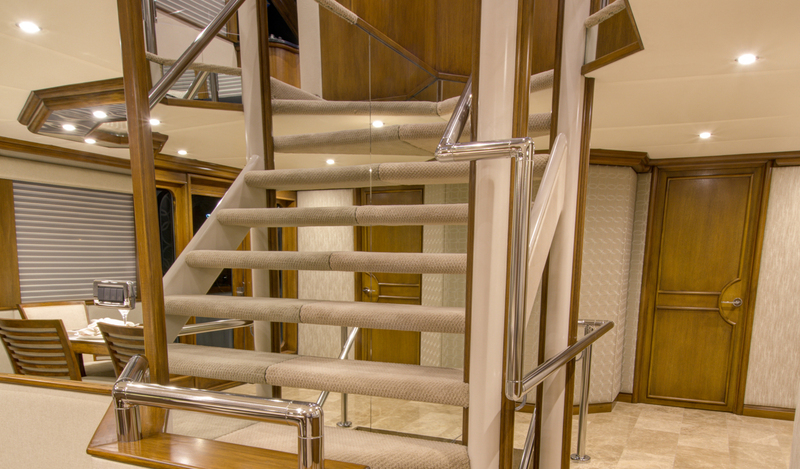 She is spacious and elegant, and thanks to her refit in 2014, she has a new interior. 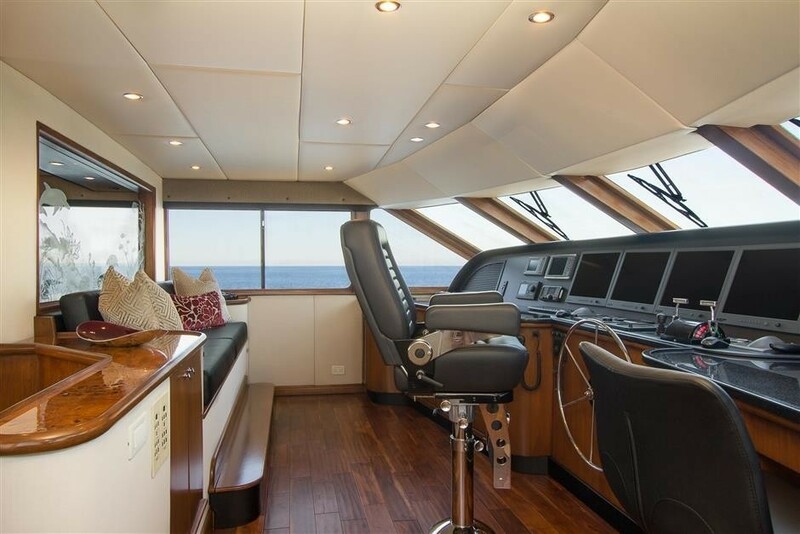 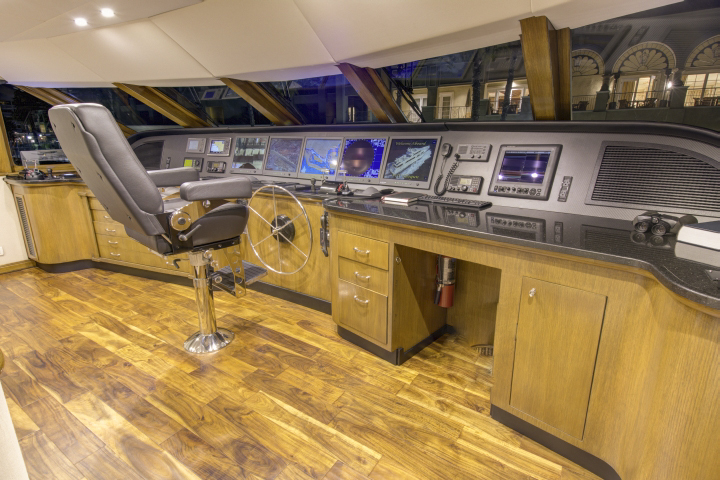 SERENITY has also been upgraded with all new A/V systems throughout the boat which includes Apple TV’s, Kaleidescape and Wifi. 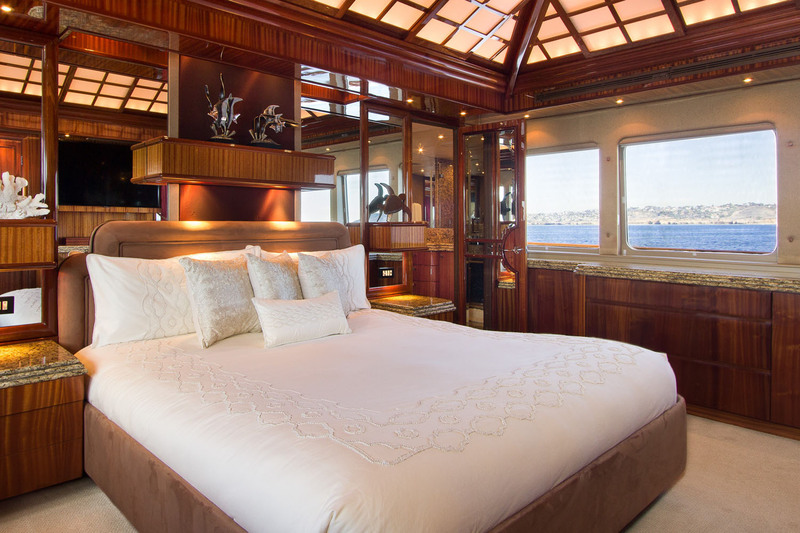 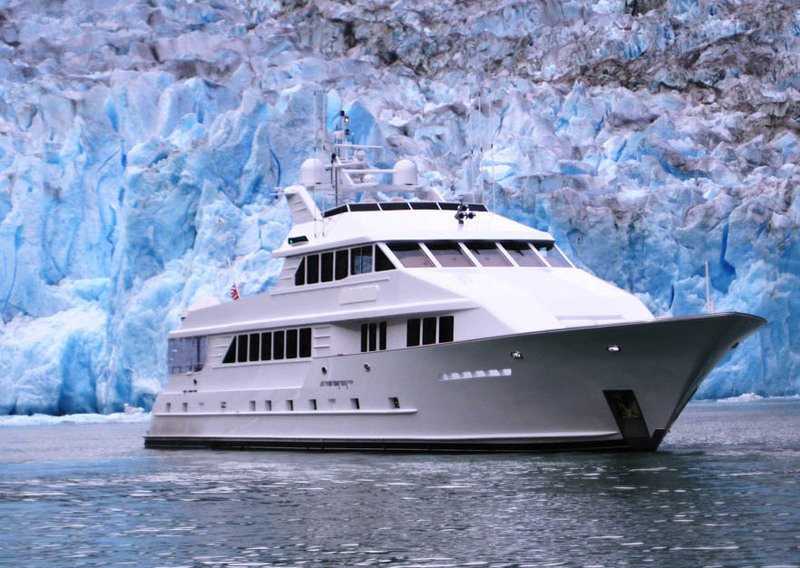 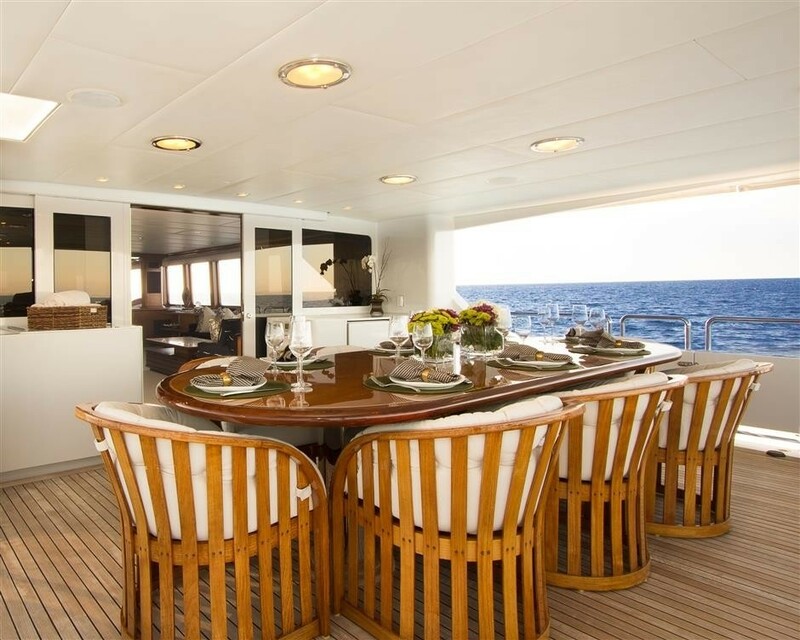 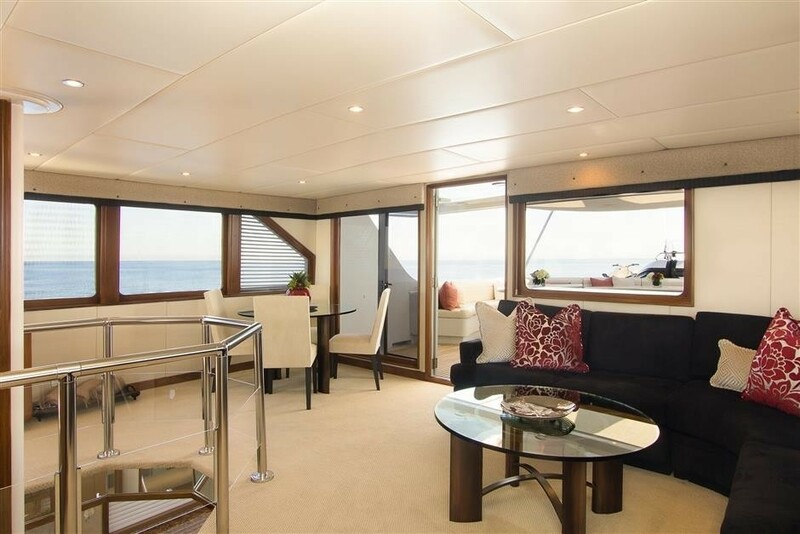 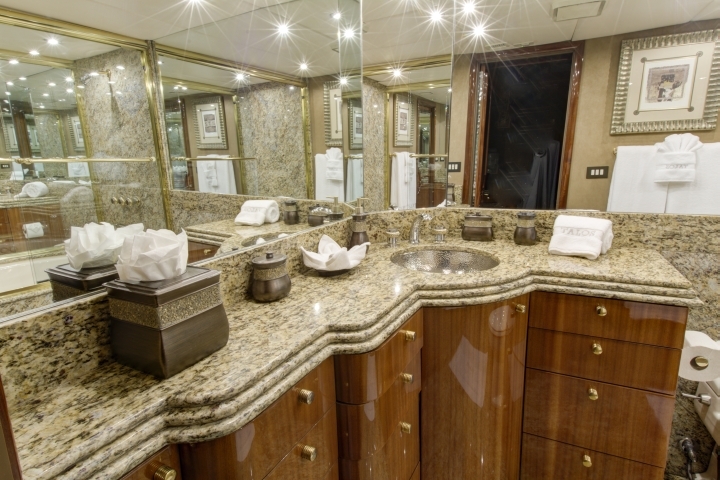 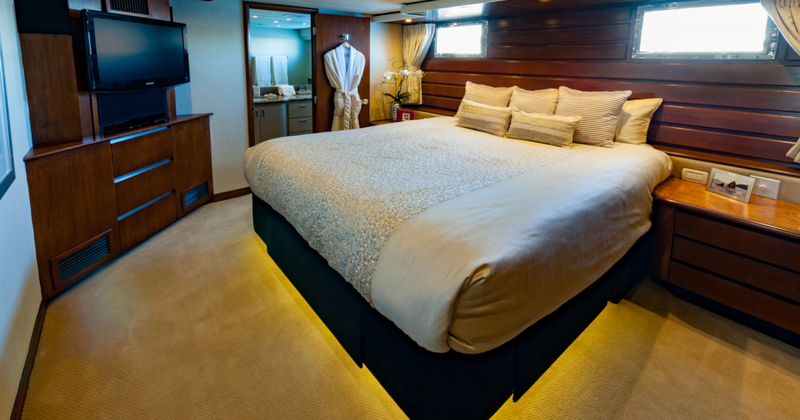 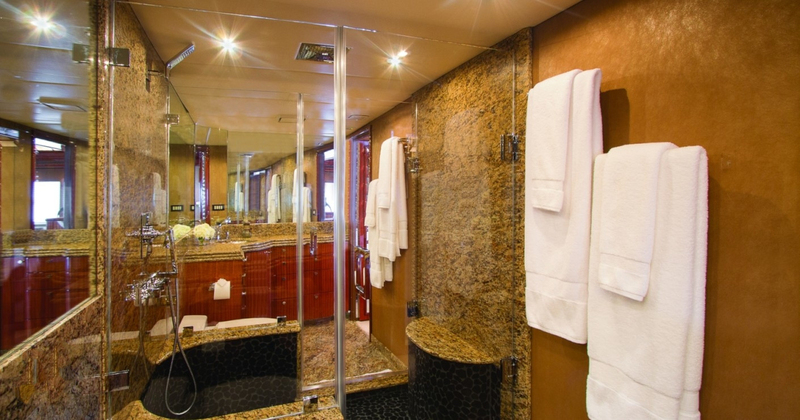 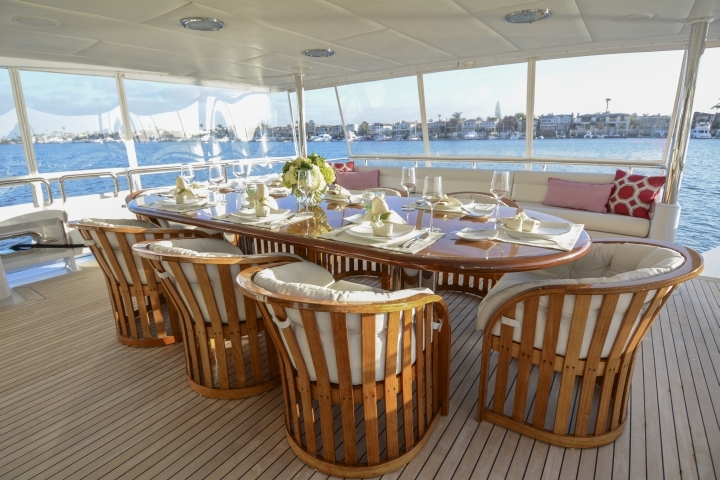 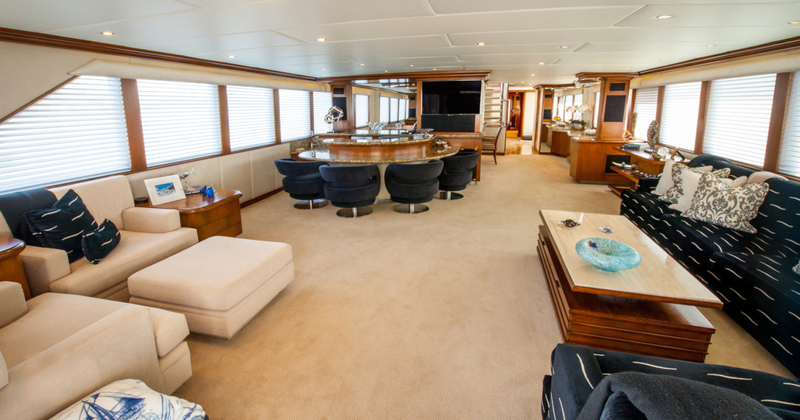 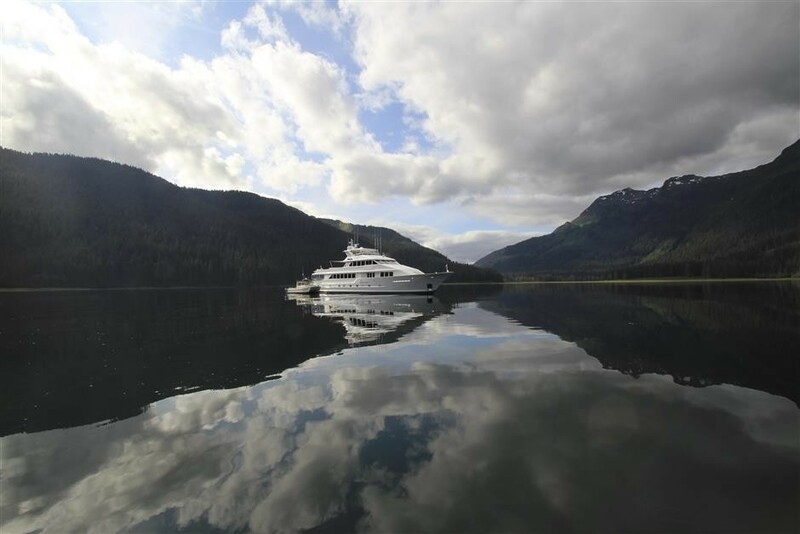 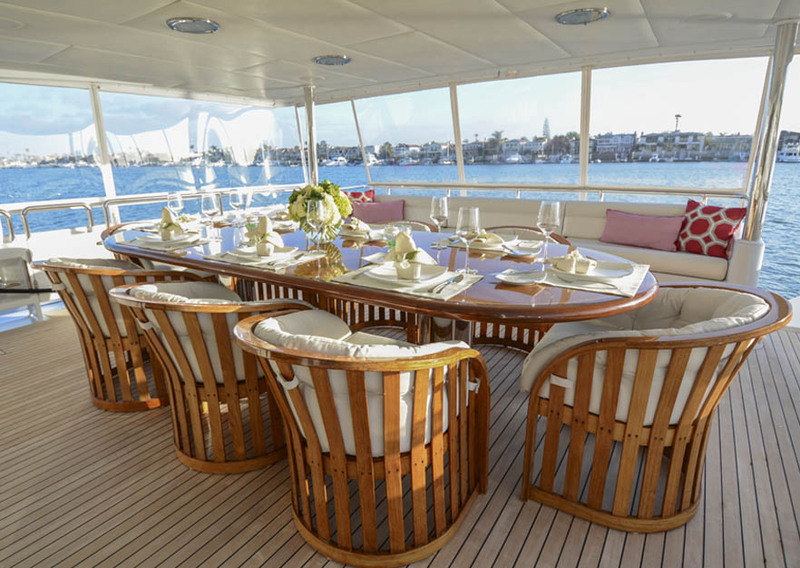 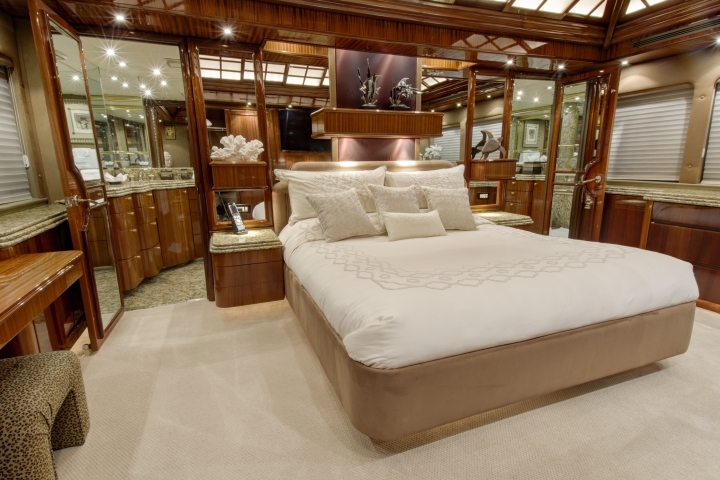 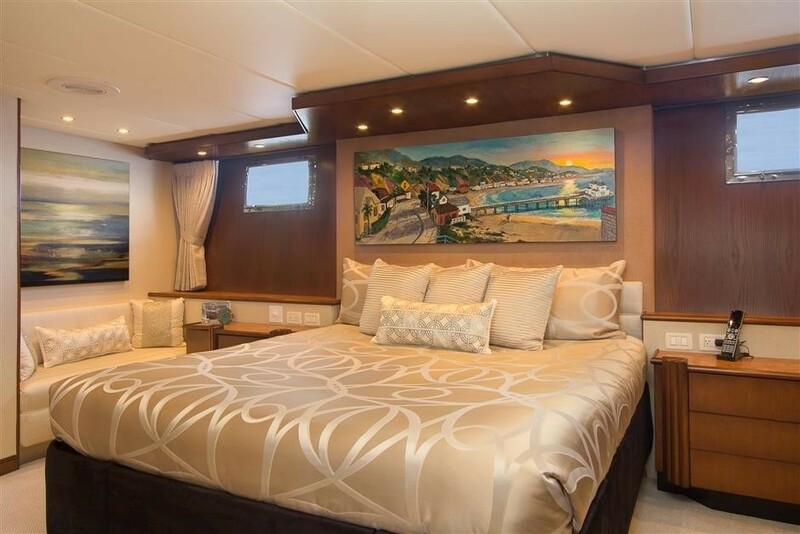 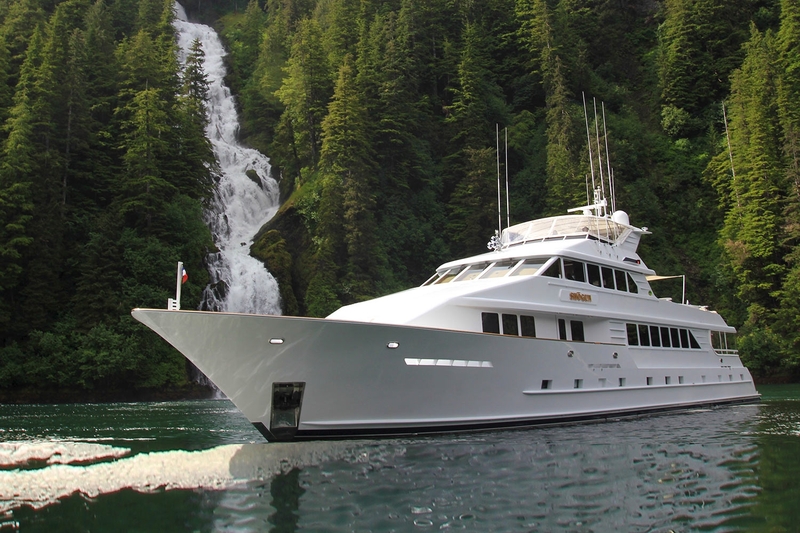 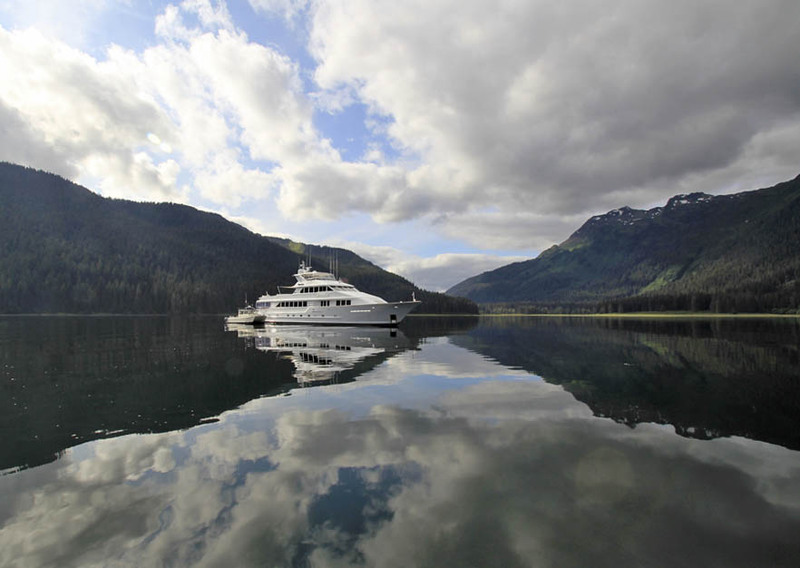 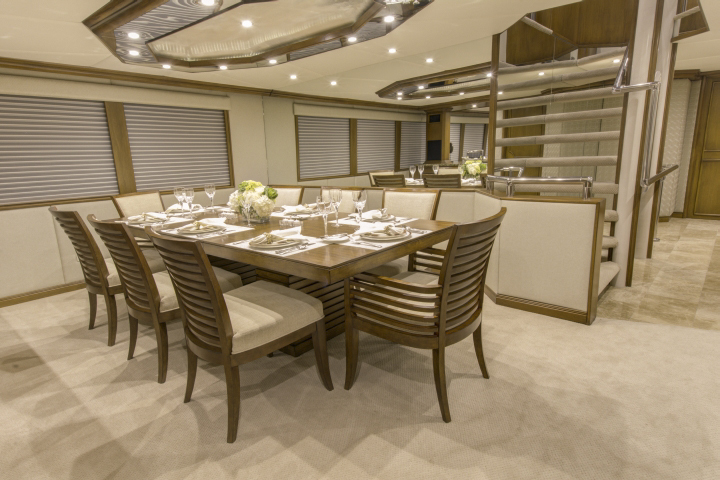 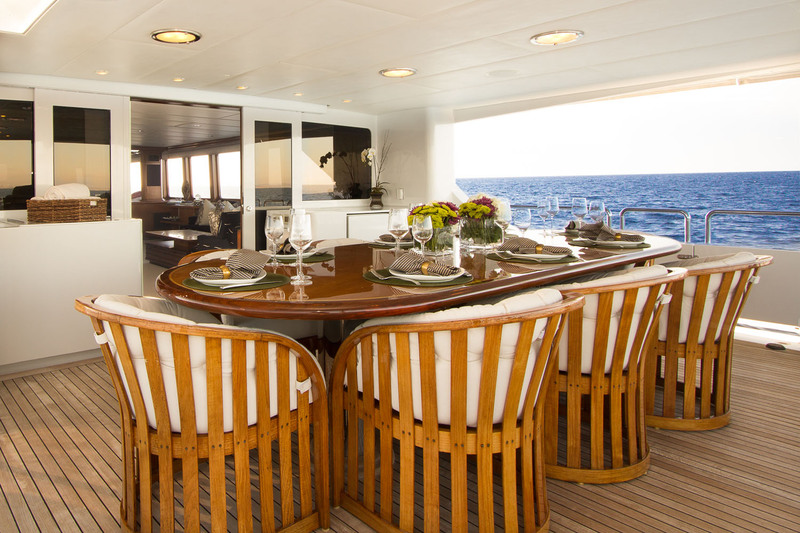 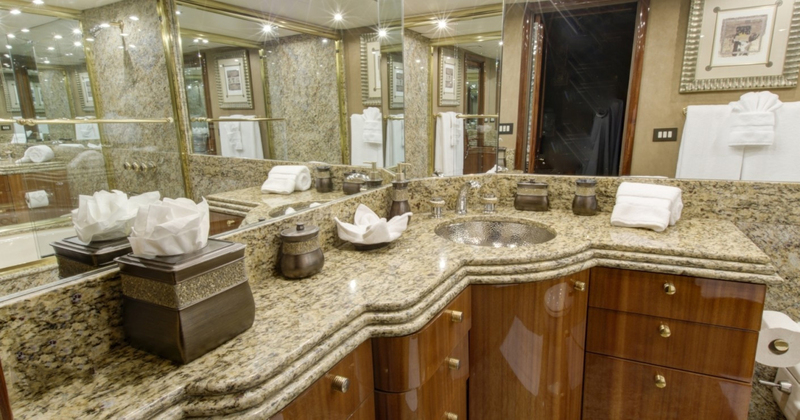 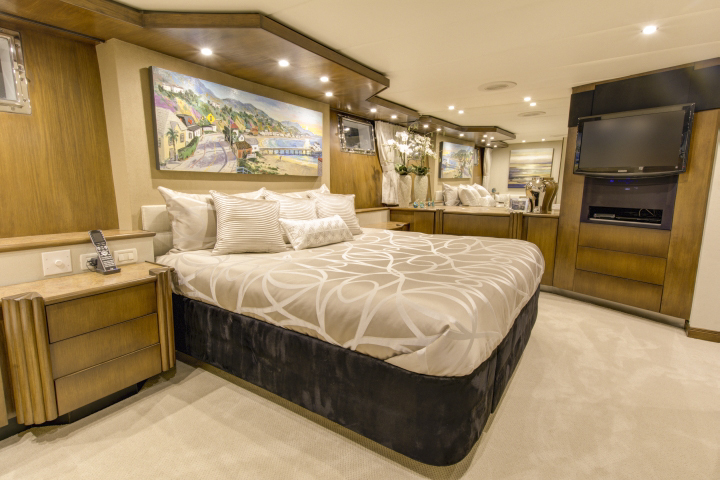 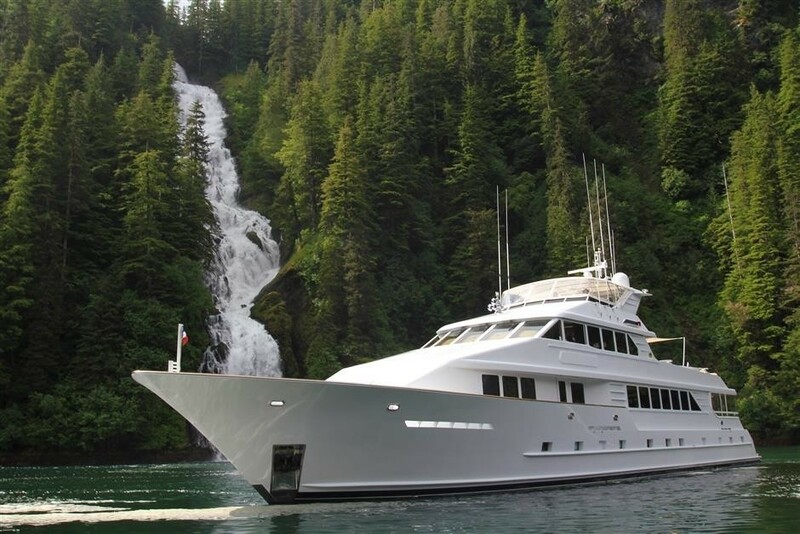 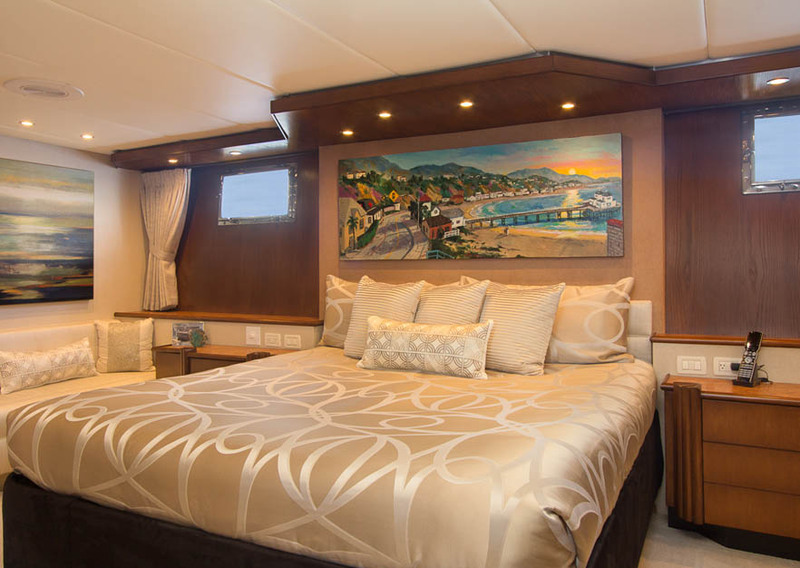 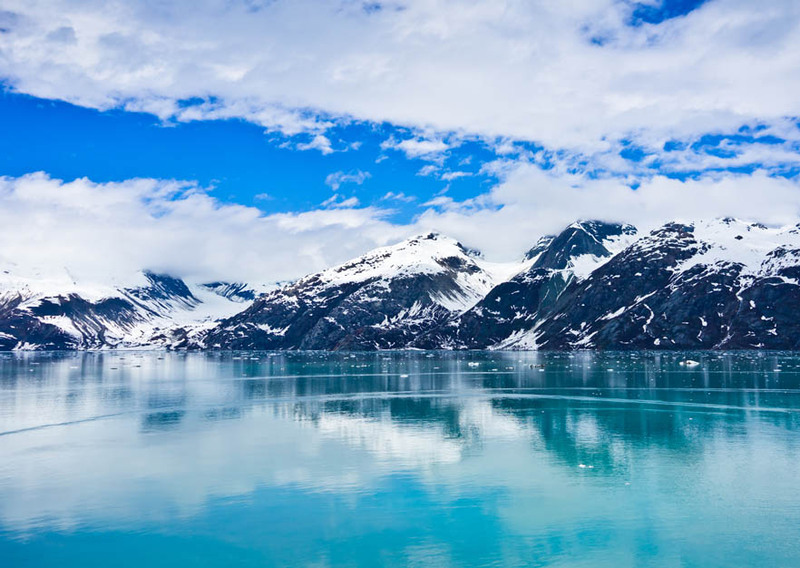 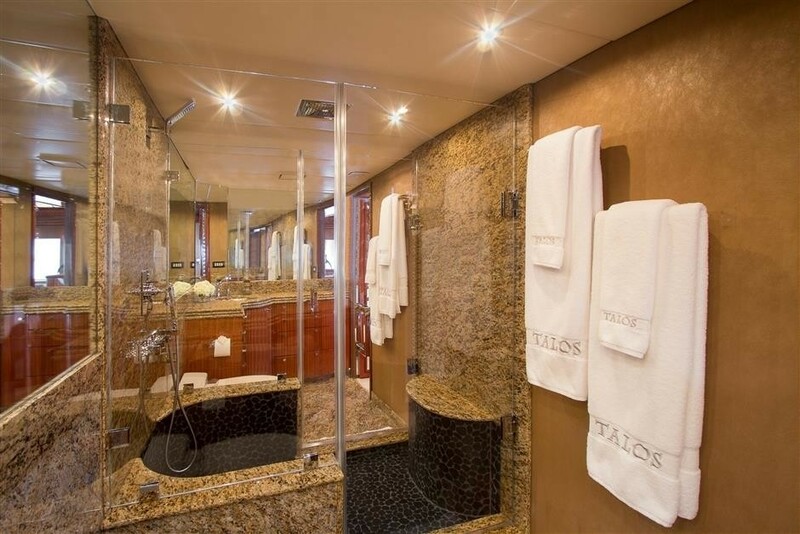 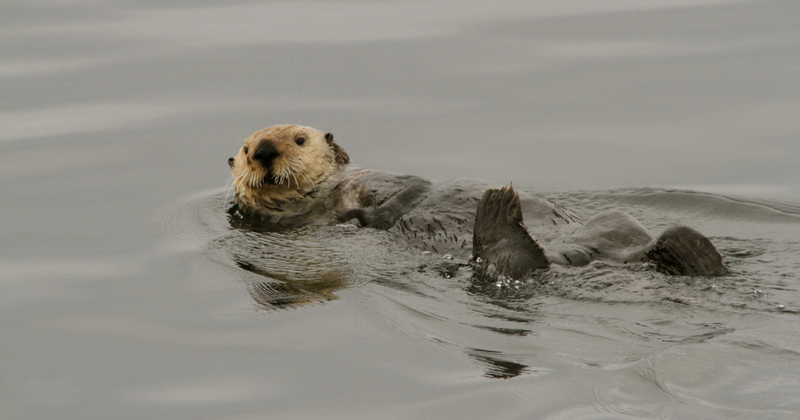 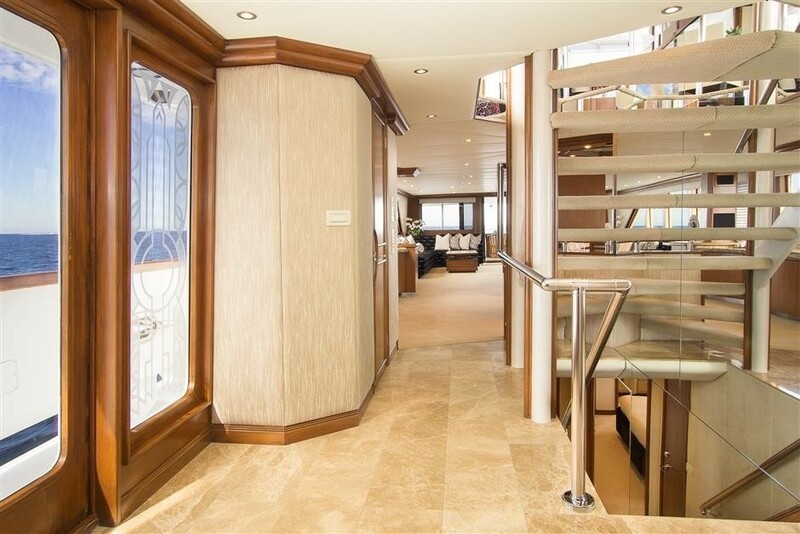 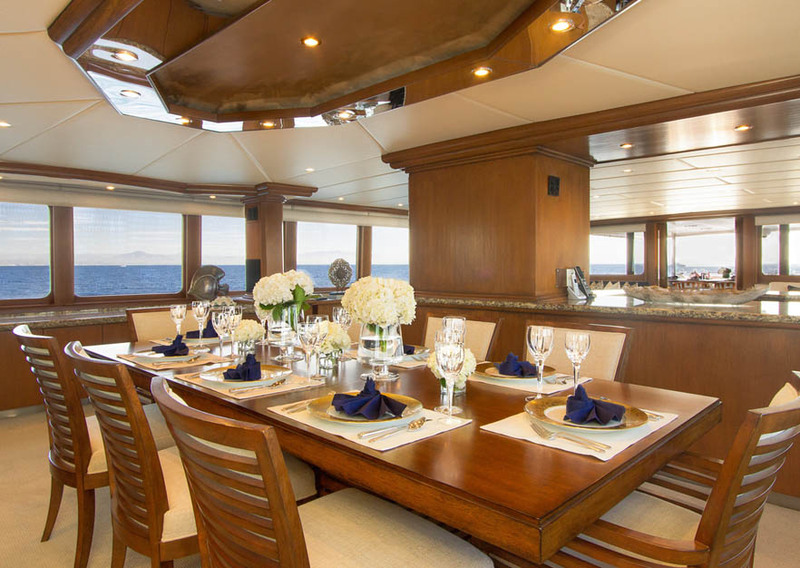 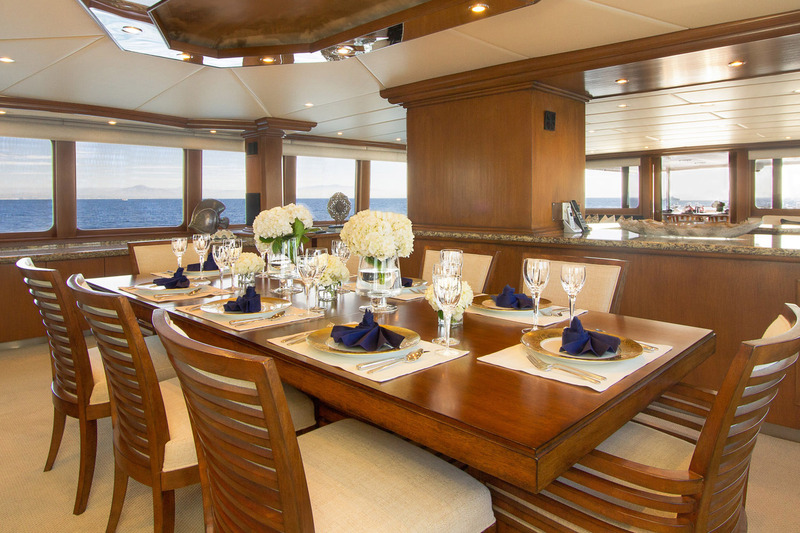 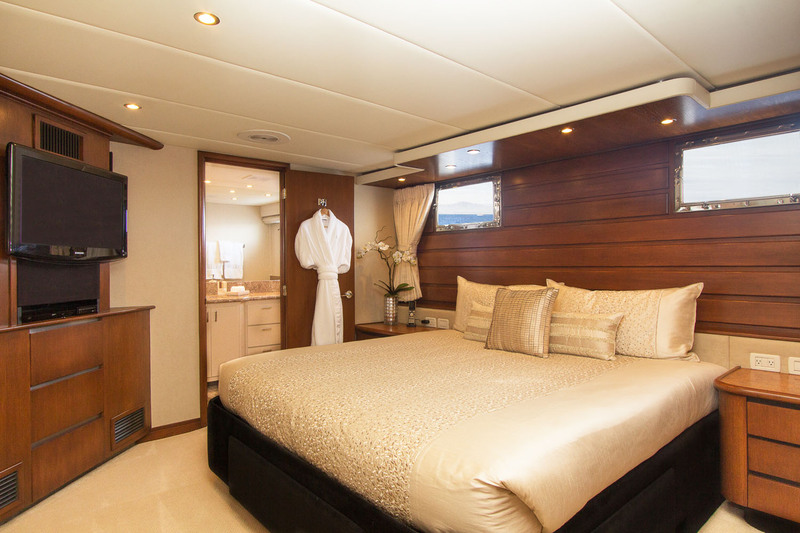 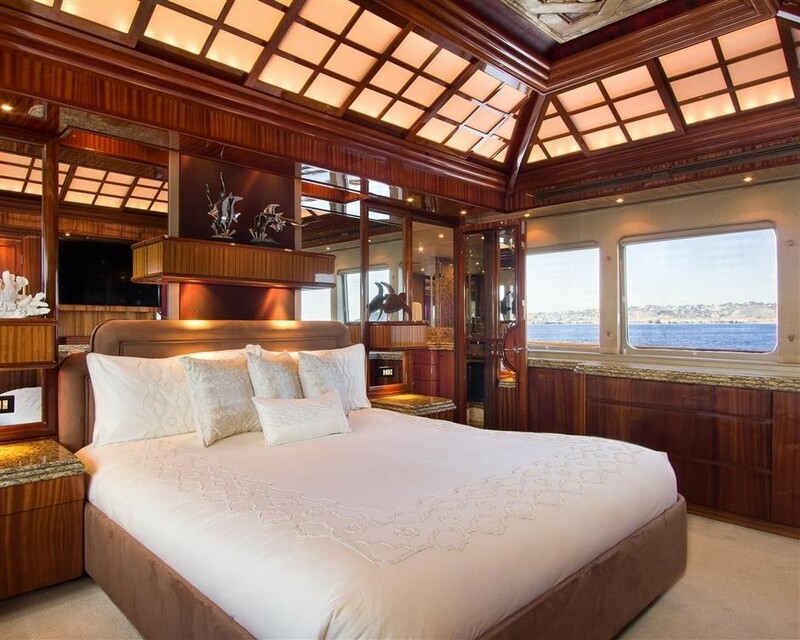 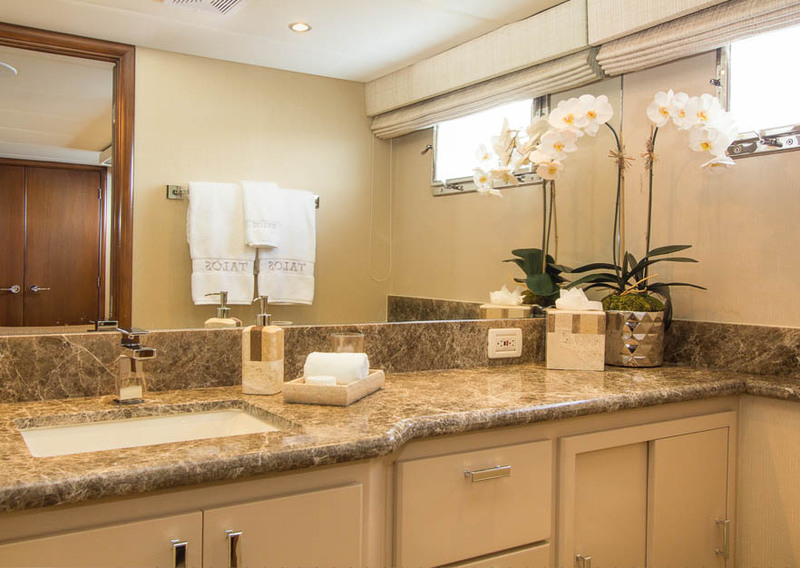 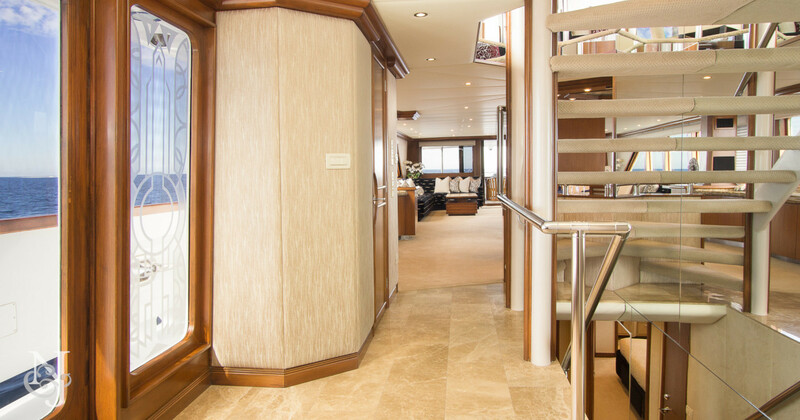 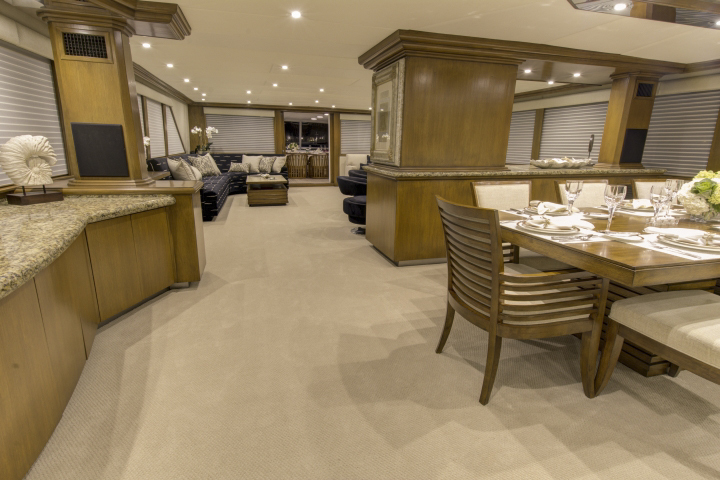 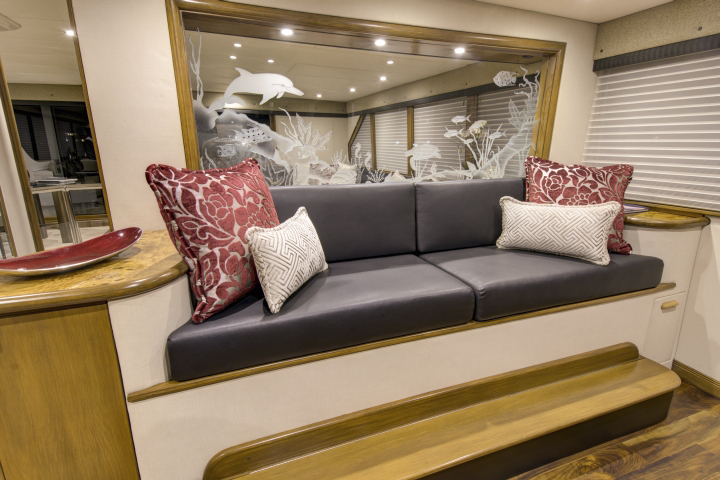 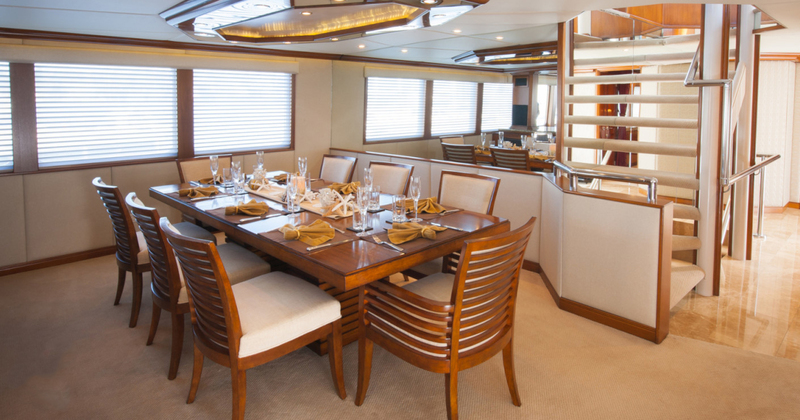 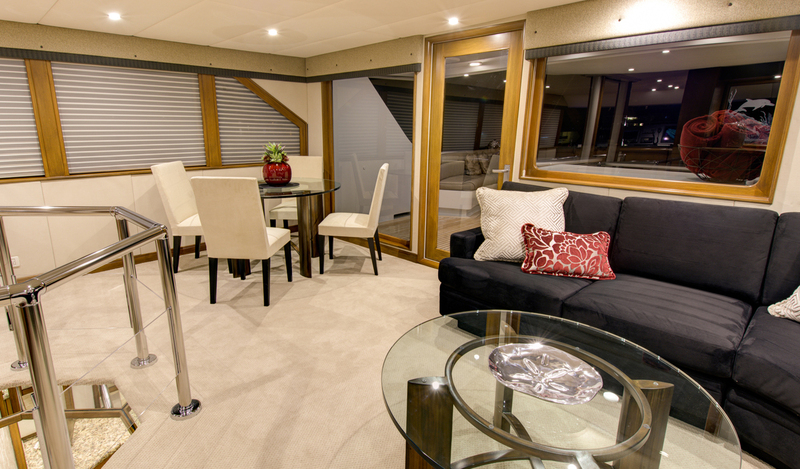 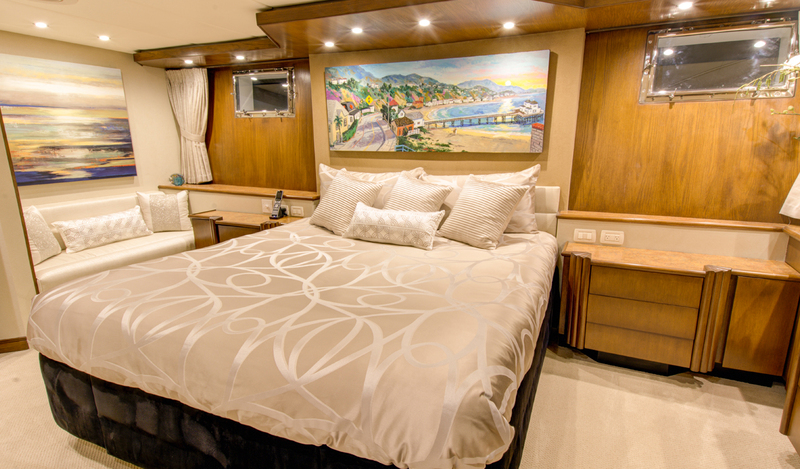 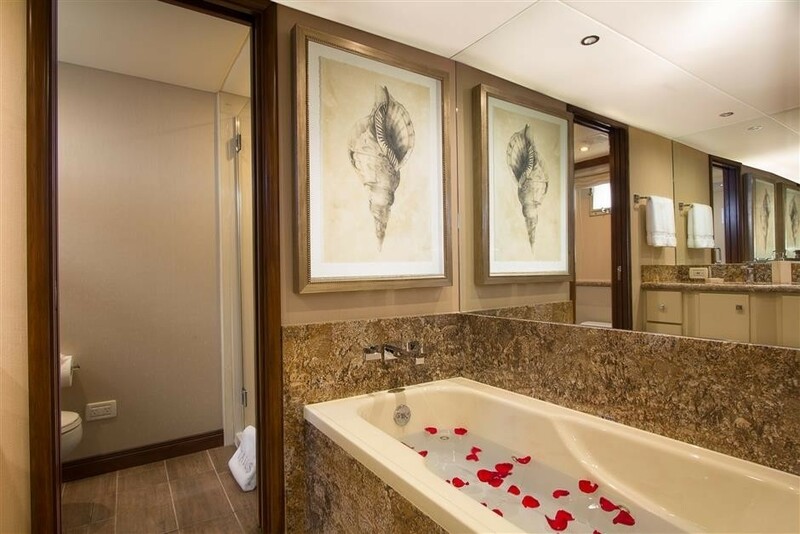 SERENITY can accommodate 8 charter guests in 4 cabins, each with a king-size bed. 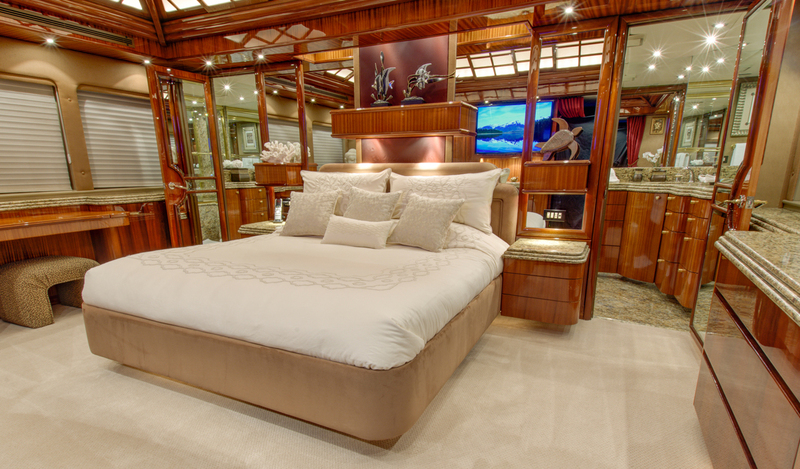 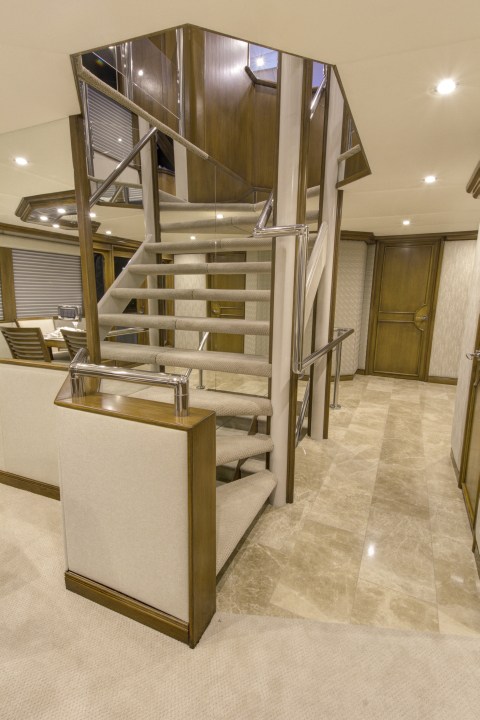 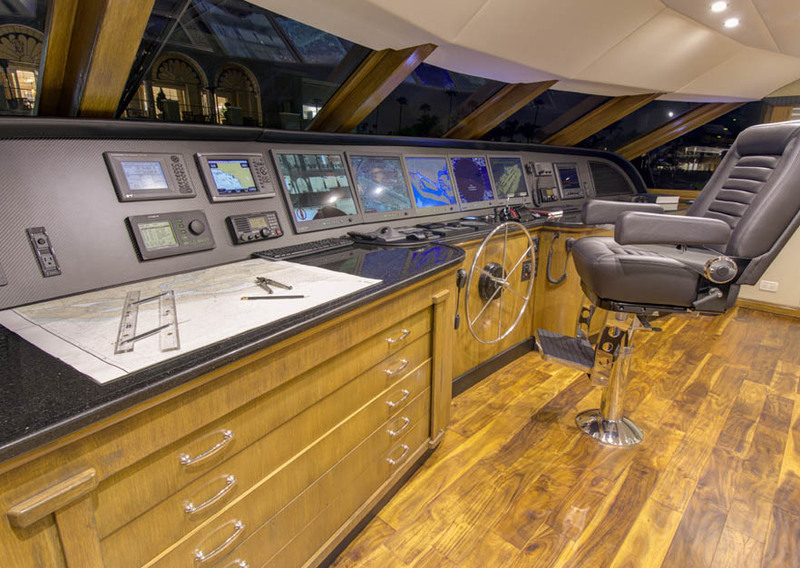 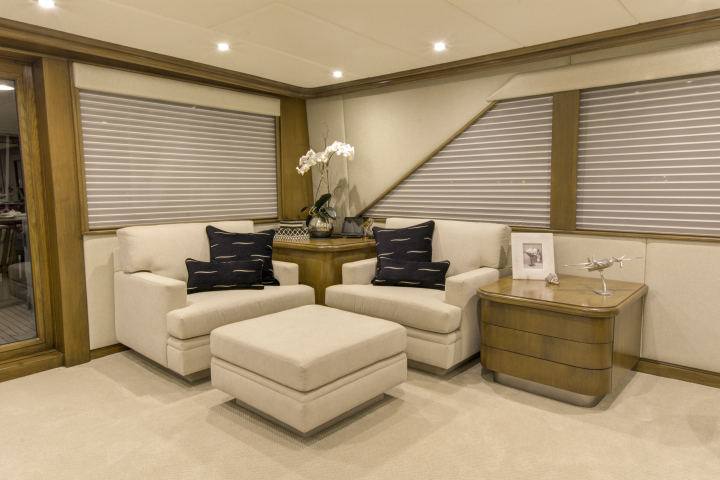 This lovely yacht boasts a lavish interior with rich fabrics and exotic woods and furniture that was designed with comfort in mind. 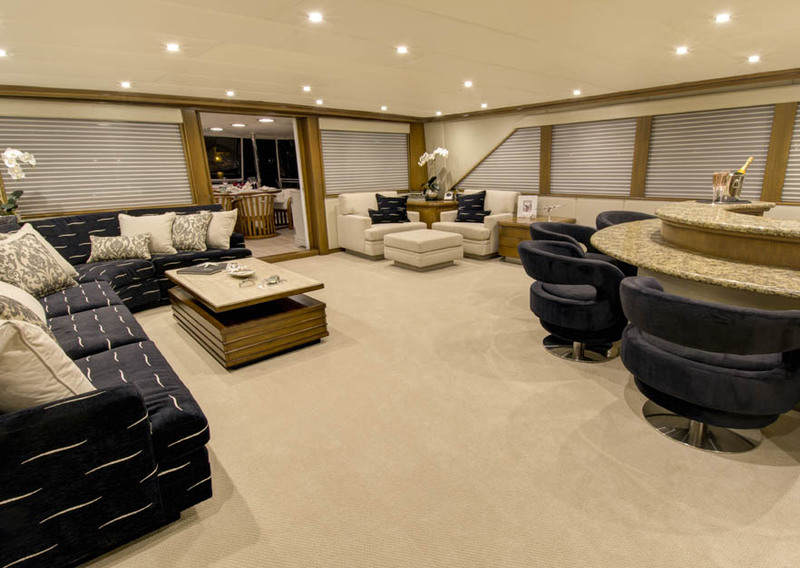 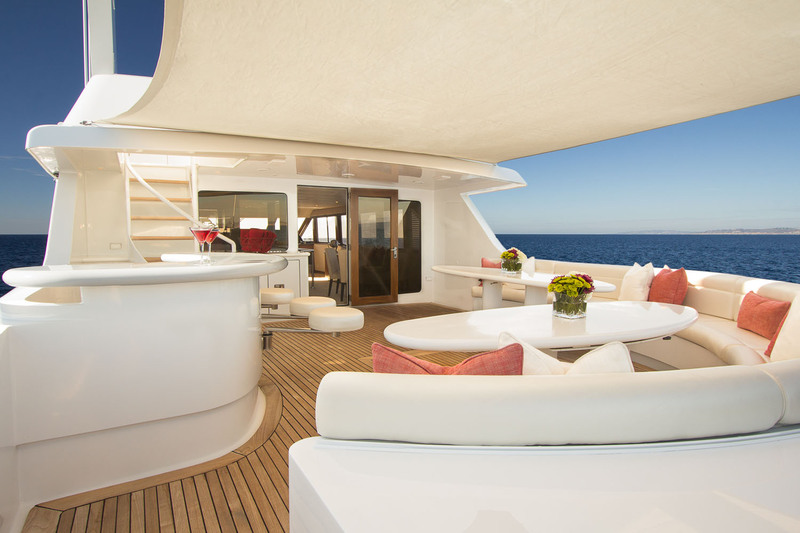 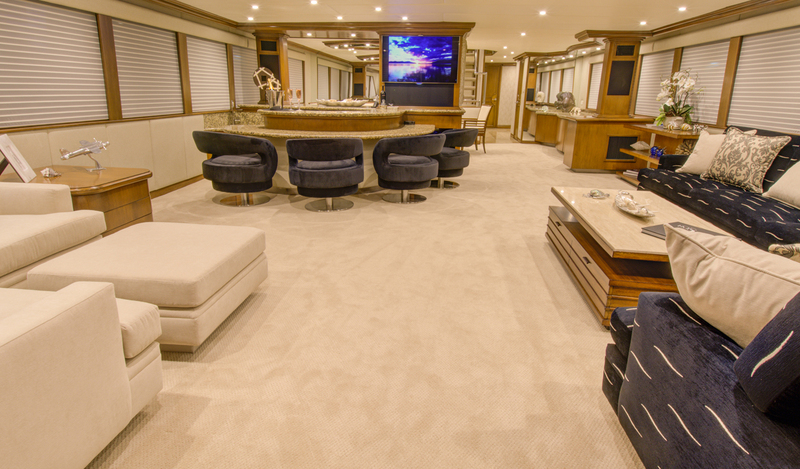 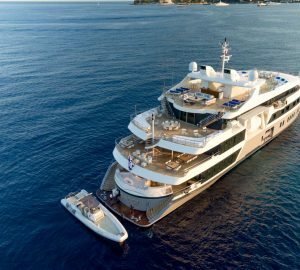 The yacht boasts plenty of interior and exterior social areas including a main salon, dining area, sky lounge, aft deck, fly bridge and the forepeak. 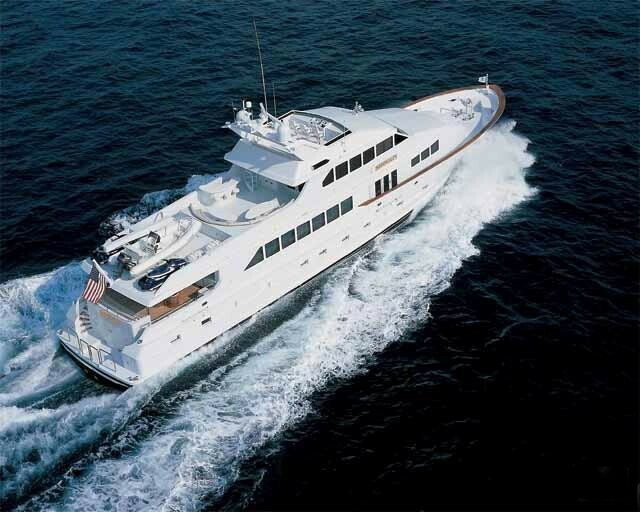 Motor Yacht SERENITY has been designed and equipped for the ultimate charter experience with plenty of water toys for guests such as an 18' Novurania tender with 115hp Johnson Evenride, two 3-person Yamaha XL700Z wave runners, 2 underwater scooters, Wakeboard, water ski’s, 8 Scuba tanks, 5 BC’s, DV’s, Snorkelling gear, two 2-person kayaks, and Fishing gear! 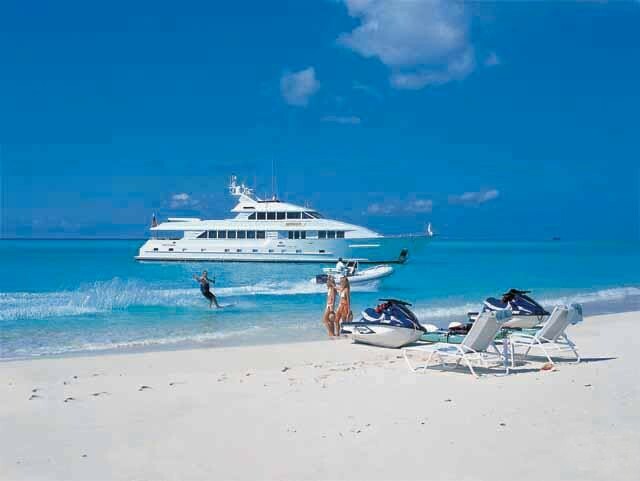 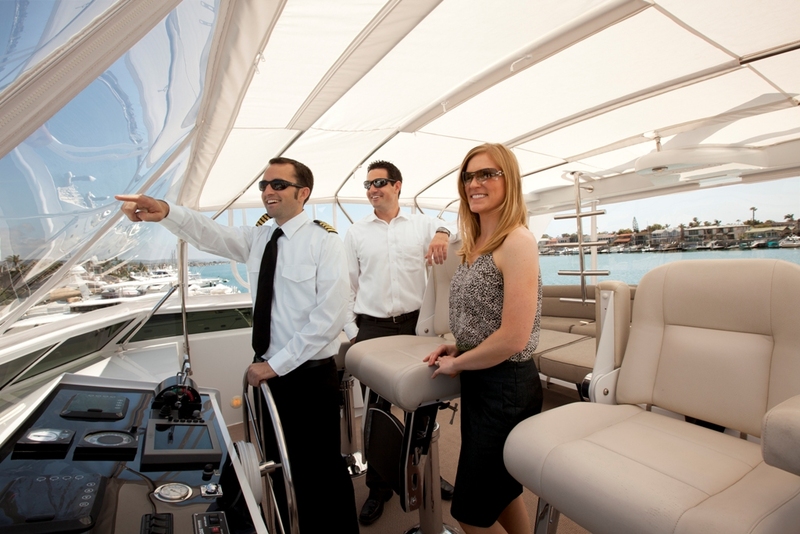 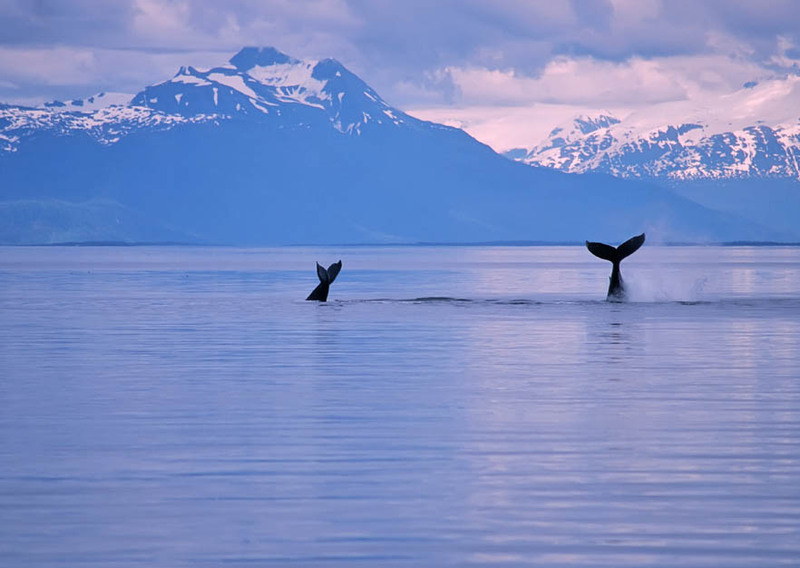 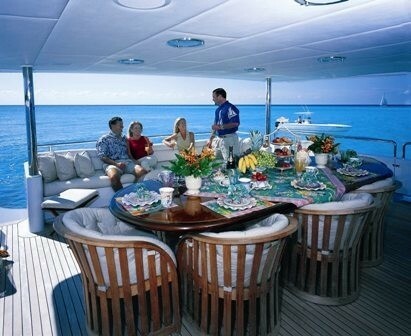 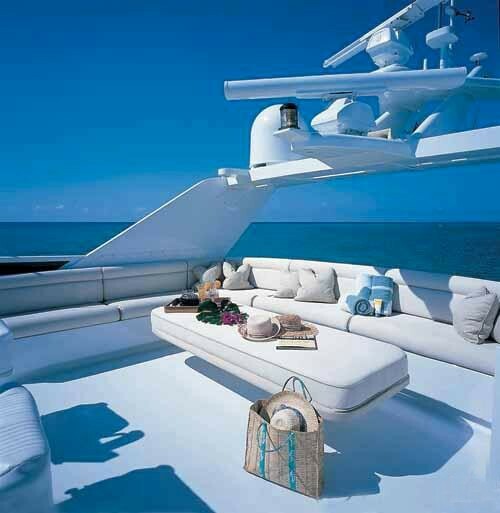 There is a crew of 6, who will make sure the guest aboard will have an amazing yacht charter experience. 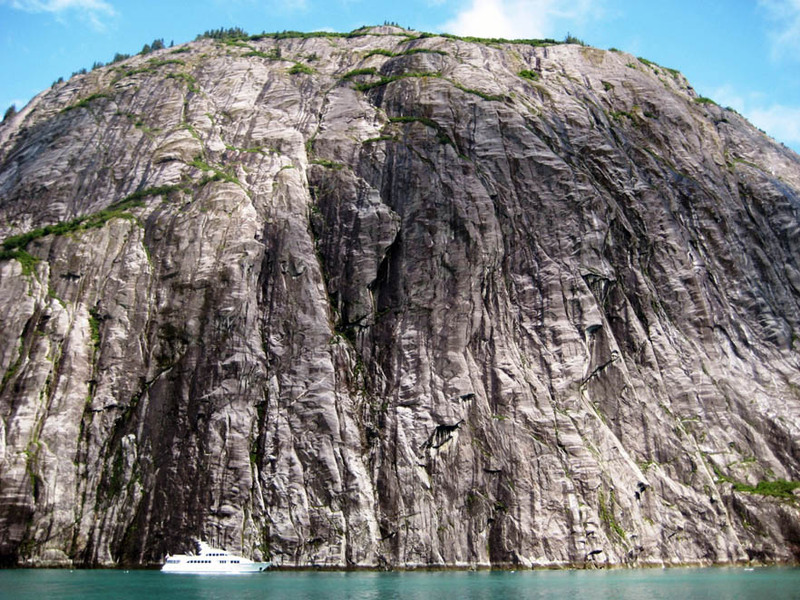 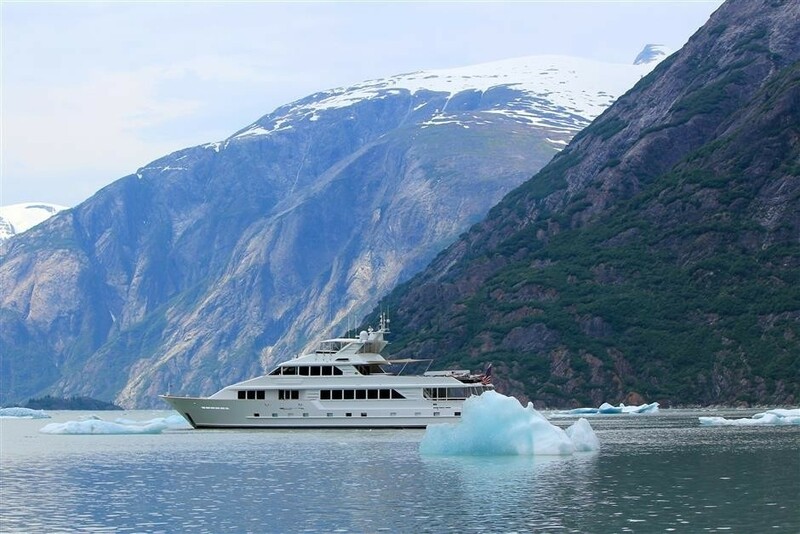 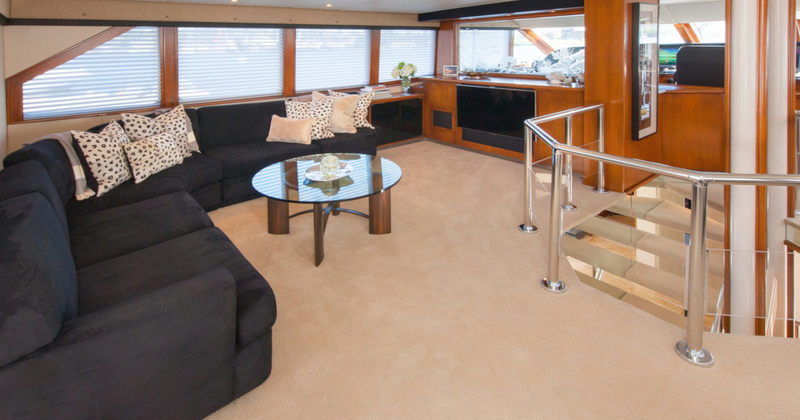 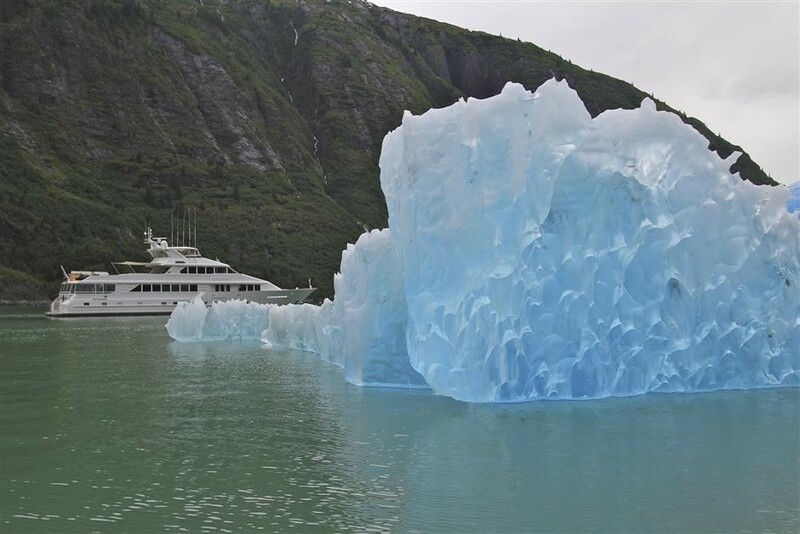 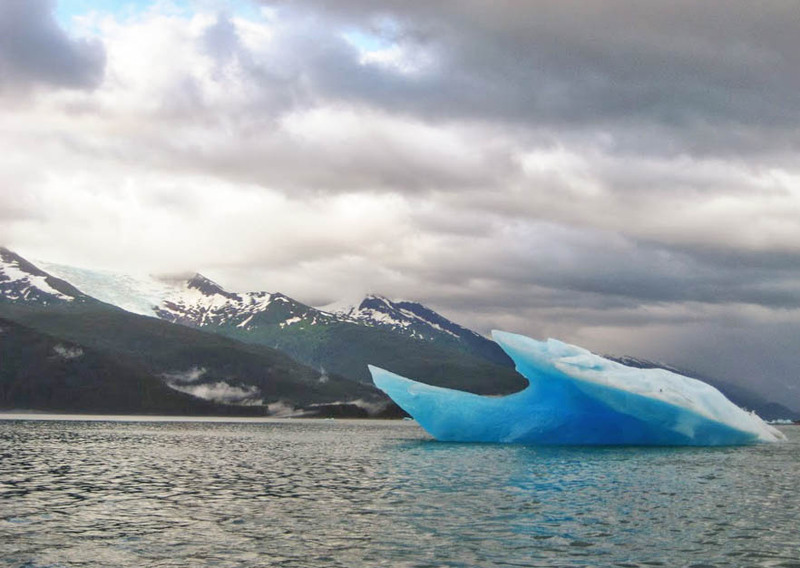 The yacht received a refit in 2014 in which her interior was completely refurbished. 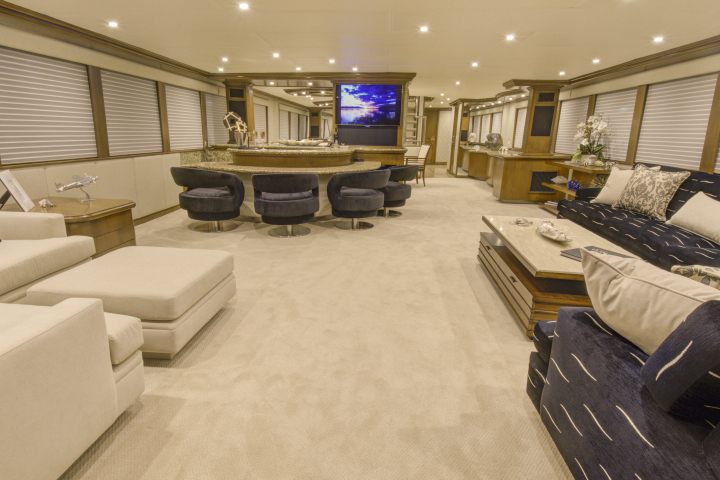 New updates included: New carpet, marble entry floor, clear mirrored walls, fabric on walls, overheads, led imtra lights, all woodwork stained darker, all sofas and chairs recovered, bar chairs, dining room set, coffee table, removed brass from railings, hardwood floor in bridge, dash layout with updated electronics, radars, exterior camera system, and exterior cushions being replaced. 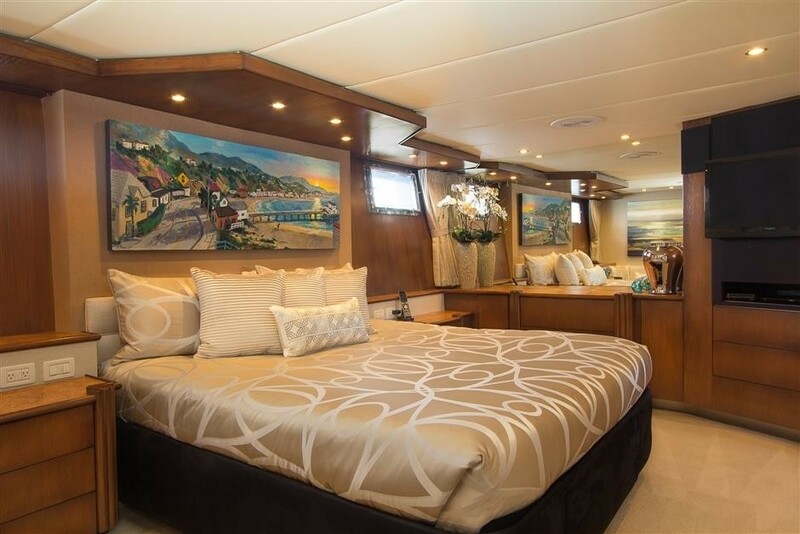 There are also new carpets in guest rooms, wallpaper, overheads, bed linens, the woodwork was also stained darker in guest cabins, bathroom floors, and her cabinets were updated, imtra lighting, main salon window shades replaced, artwork throughout yacht. 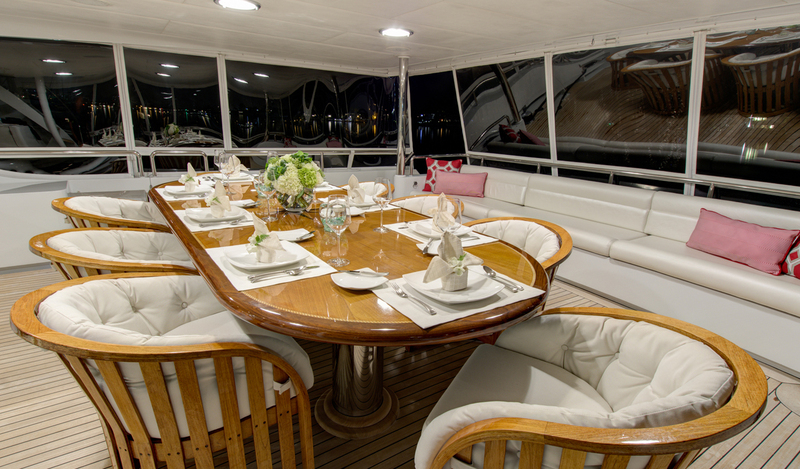 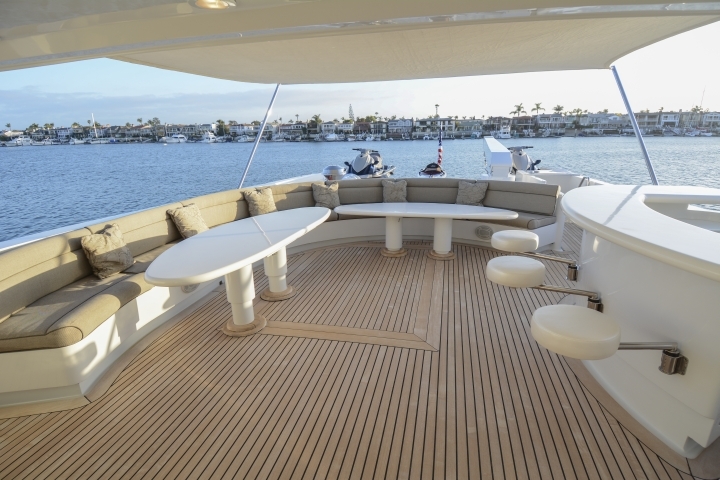 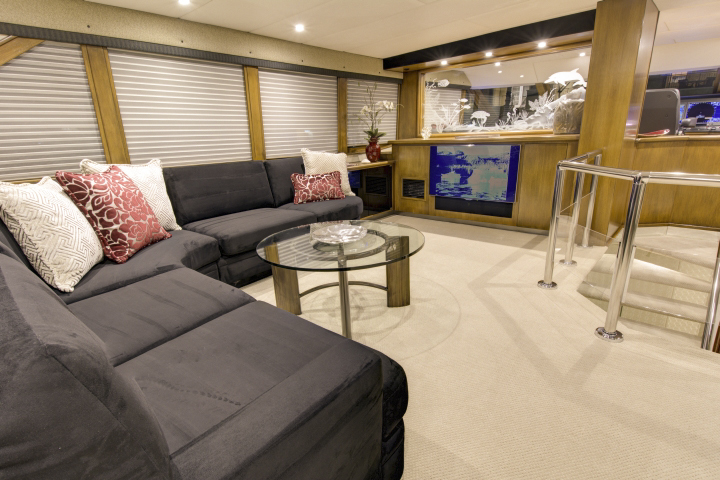 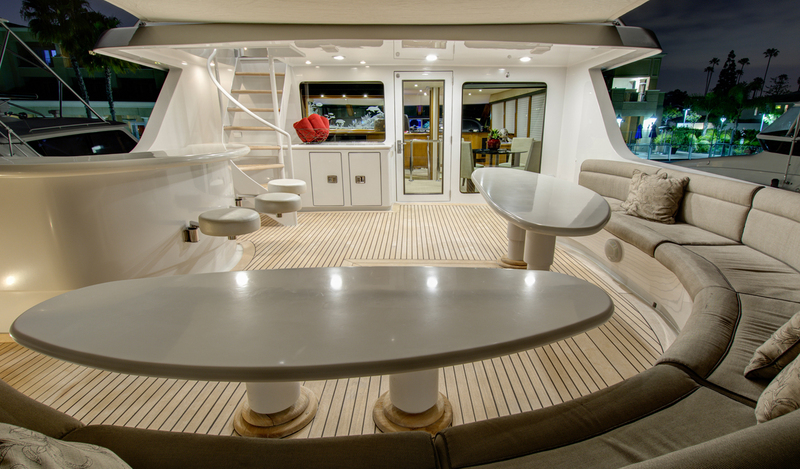 The two tables in the sky lounge (sitting table and coffee table) were custom made in Napa for the boat. 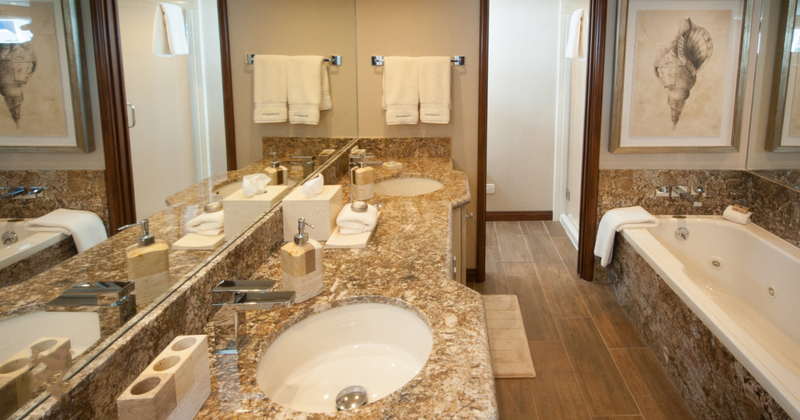 Shoji screens in the lower guest rooms have been removed to allow natural light in. 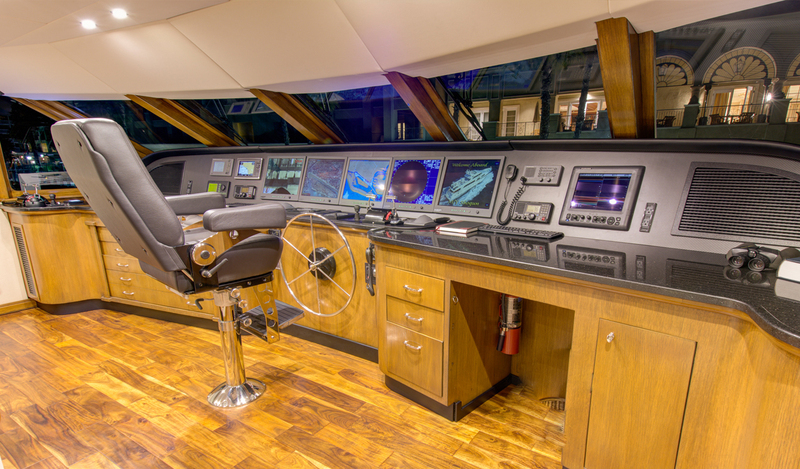 Updated navigation computers and software, including Flir (thermal camera for night vision). 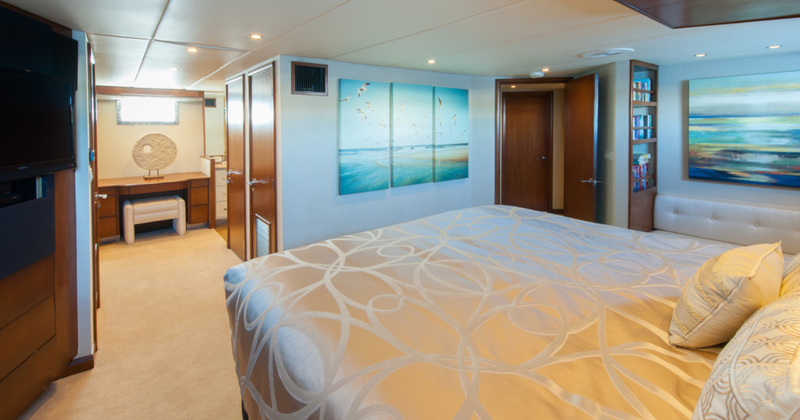 Master stateroom had minimal changes. 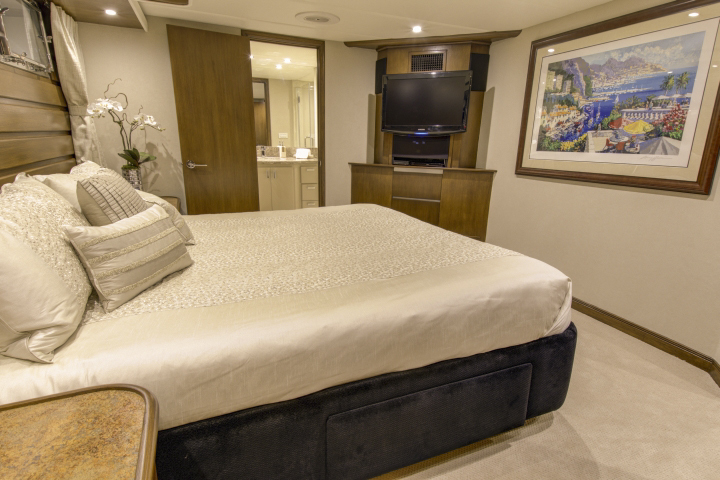 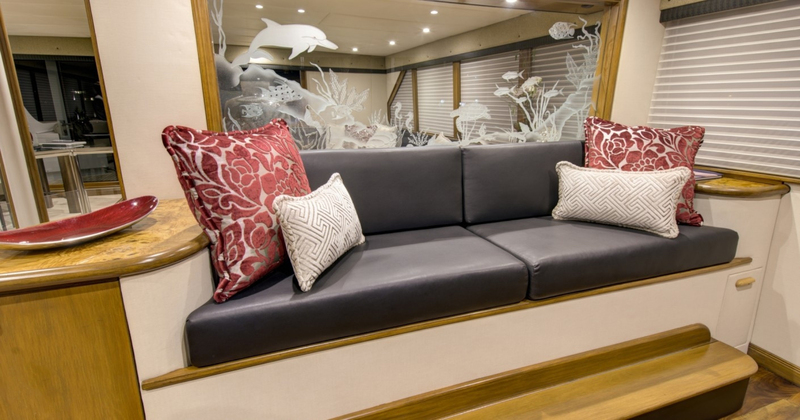 She features an oversized on-deck Master Stateroom with a centerline king size bed, large windows, two huge closets, a full entertainment system, settee and ample dresser storage. 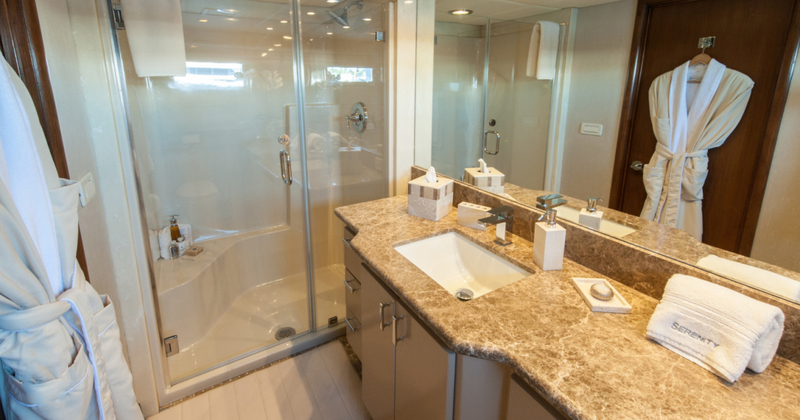 The master ensuite features his-and-hers bathrooms with marble countertops, separated by a large Spa Pool tub and shower. 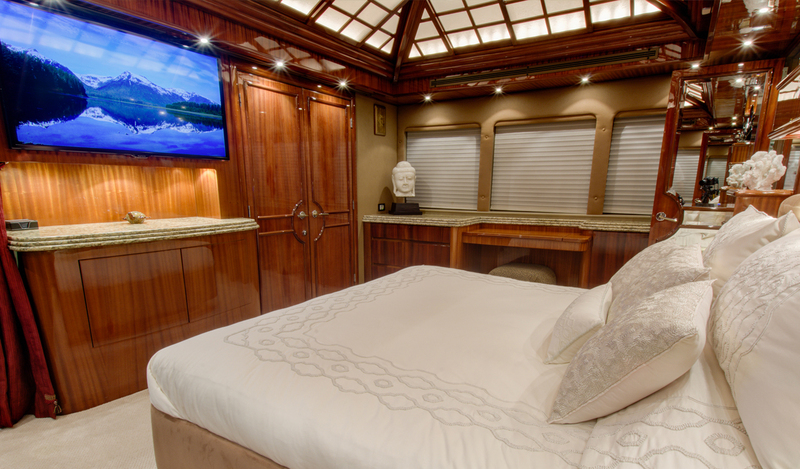 The full-beam VIP Suite has a walk-around king size bed and entertainment centre with TV and DVD. 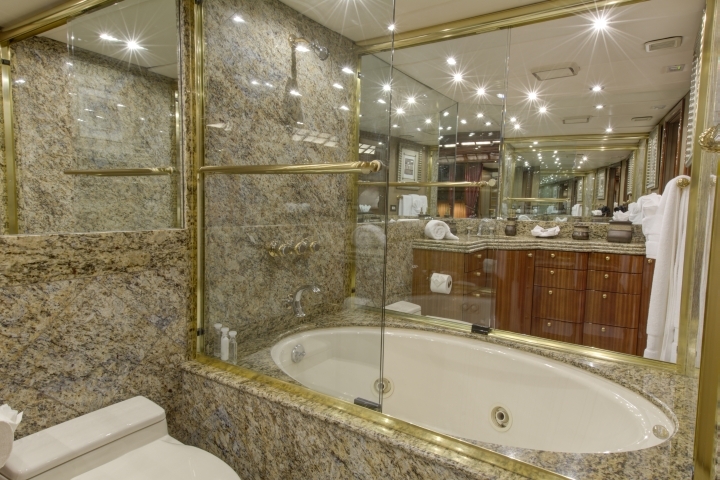 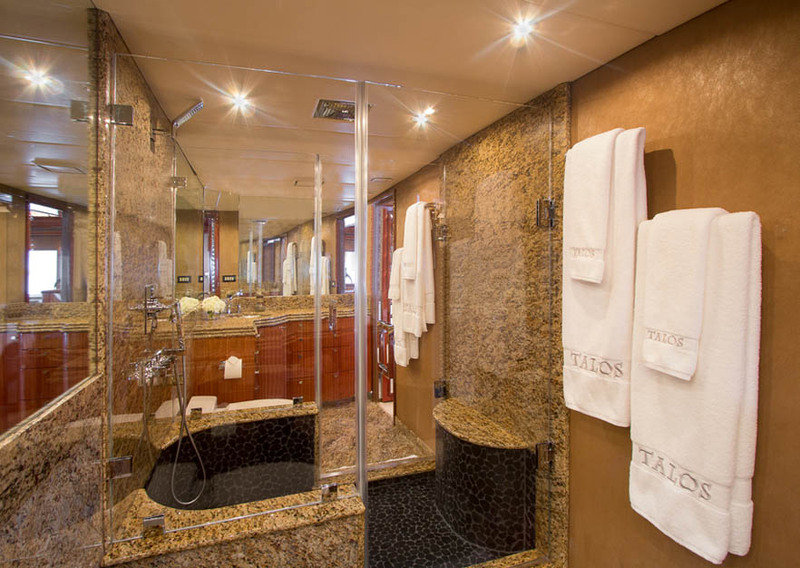 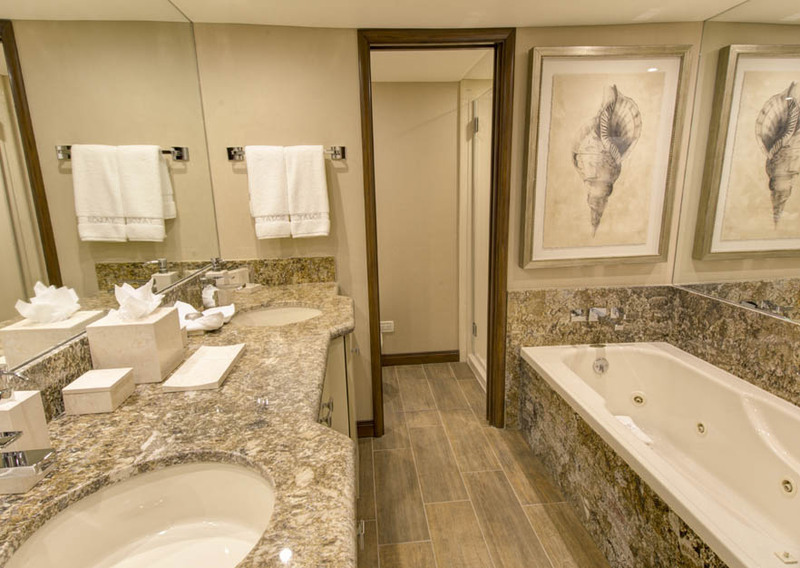 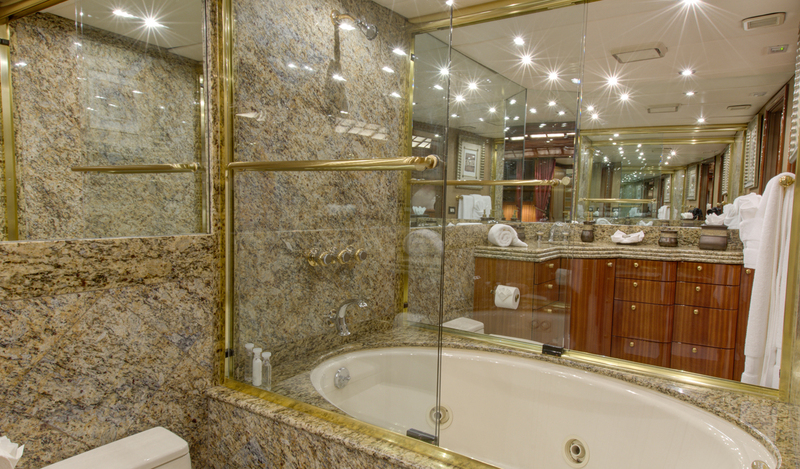 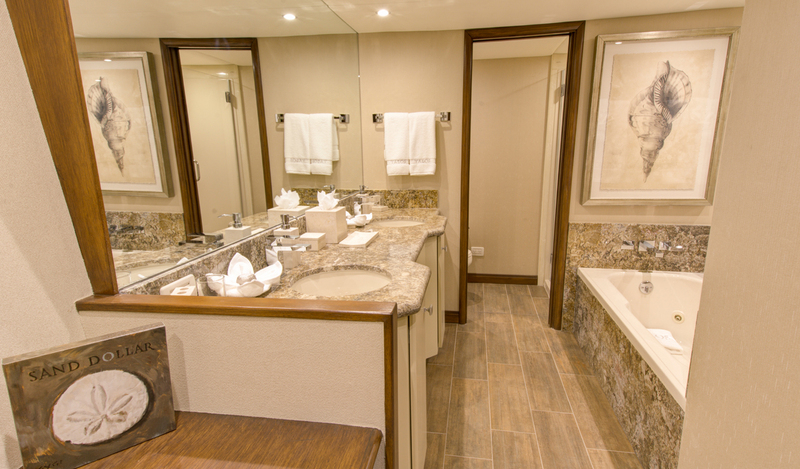 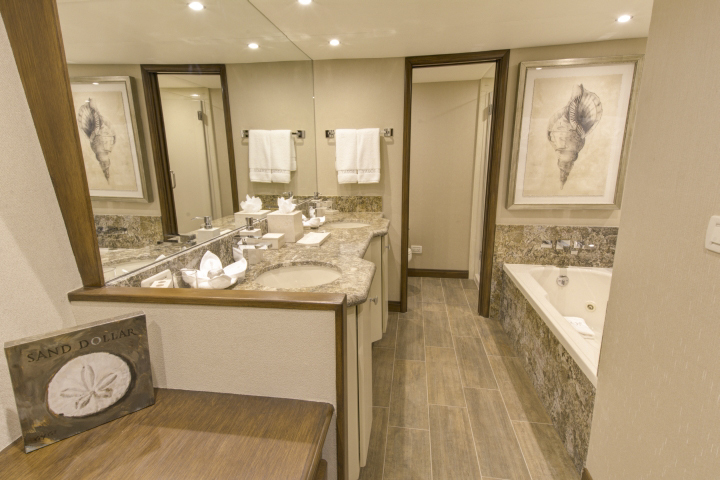 The en-suite bath has a double sink and vanity, spa pool tub and separate stall shower. 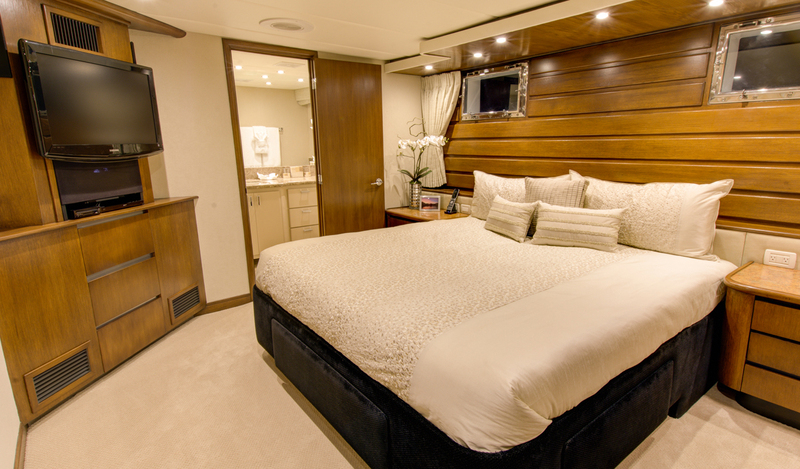 There are 2 additional guest staterooms each with a walk-around king size bed, entertainment centre with TV/DVD, and en-suite with shower. 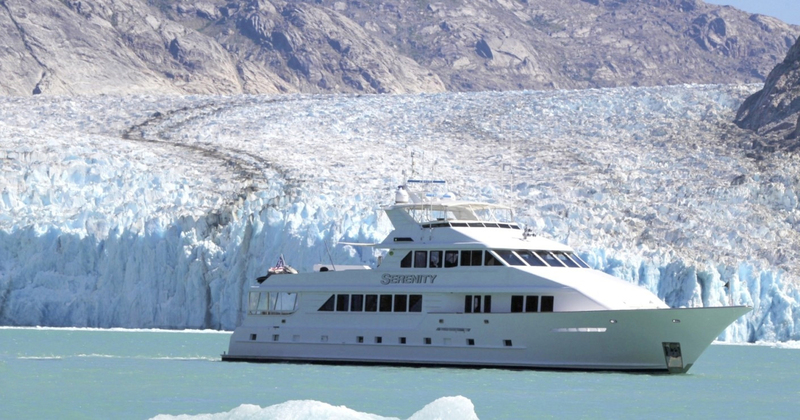 Charter boat SERENITY has a fantastic array of extras onboard including the following Tenders and Toys: 30’ Alaskan style enclosed towed fishing tender with heater 18' Novurania tender w/ 115hp Evenride 2 x 2-person Yamaha VX waverunners 2 paddleboards Wakeboard, slalom water ski’s 2 single person kayaks Fishing gear Gym Equipment: Treadmill and Exercise bike Audio Visual Equipment and Deck Facilities: Kaleidescape on all TV’s, Apple TV in Main Salon and Sky Lounge, Flat Screen TV's throughout the boat, HD and Blu Ray DVD with surround sound, and iPod Docks / Stereo-Jacks Aft deck, covered: bench seating, al fresco dining, refrigerator, access to swim platform and sundeck. 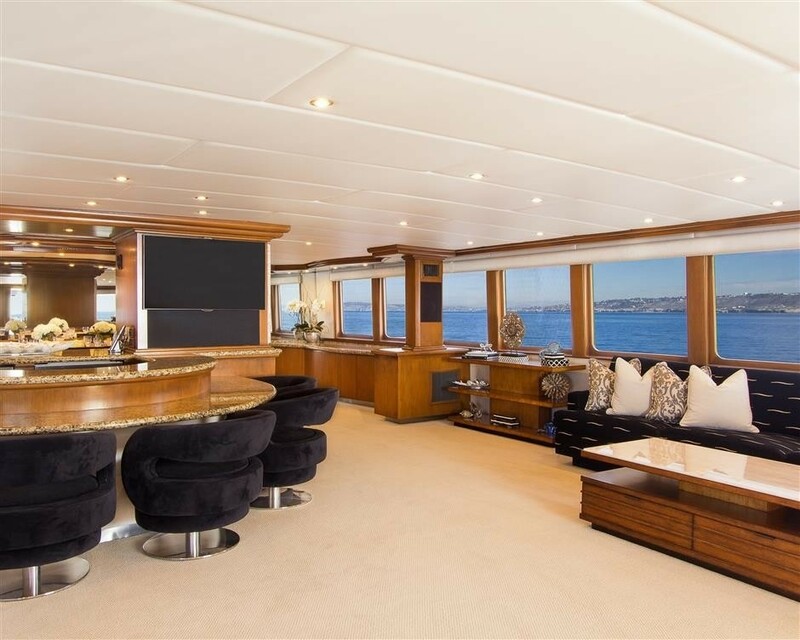 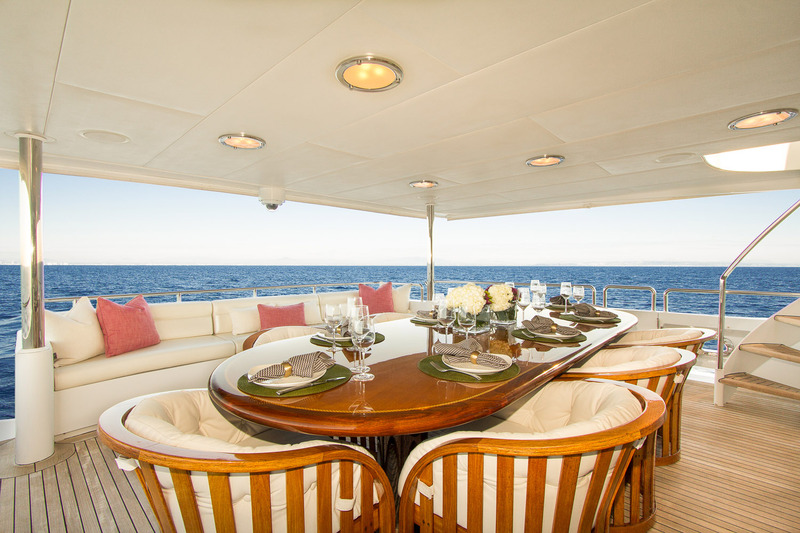 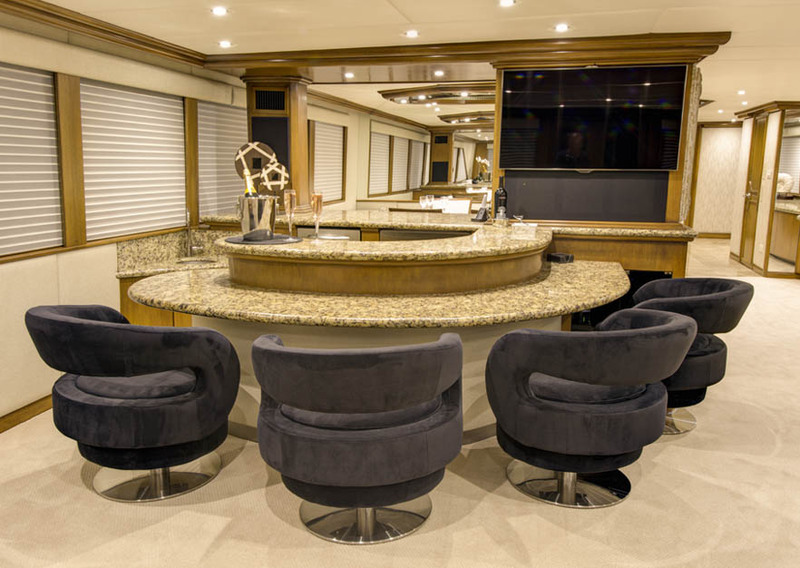 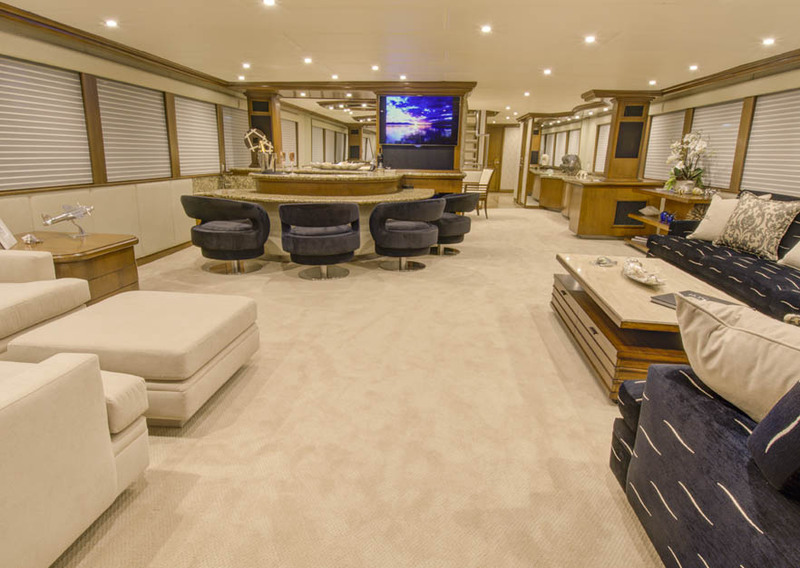 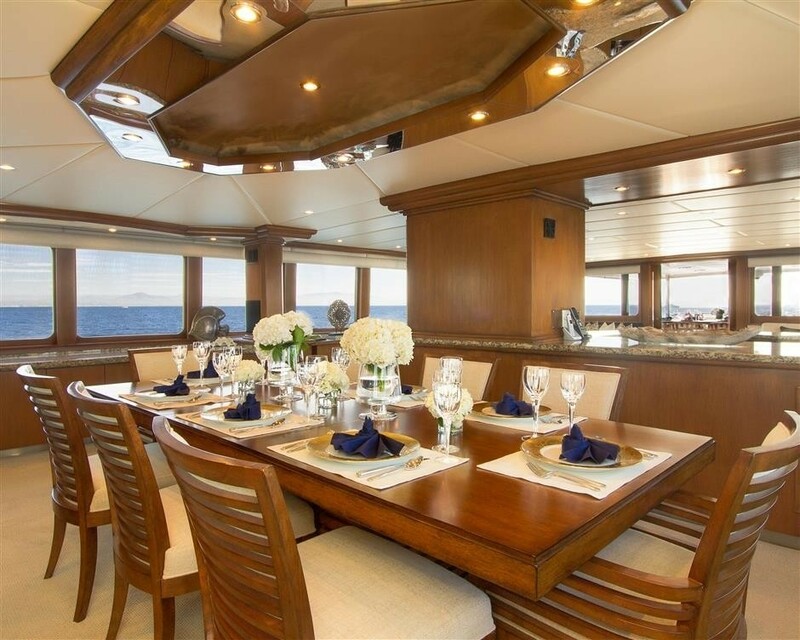 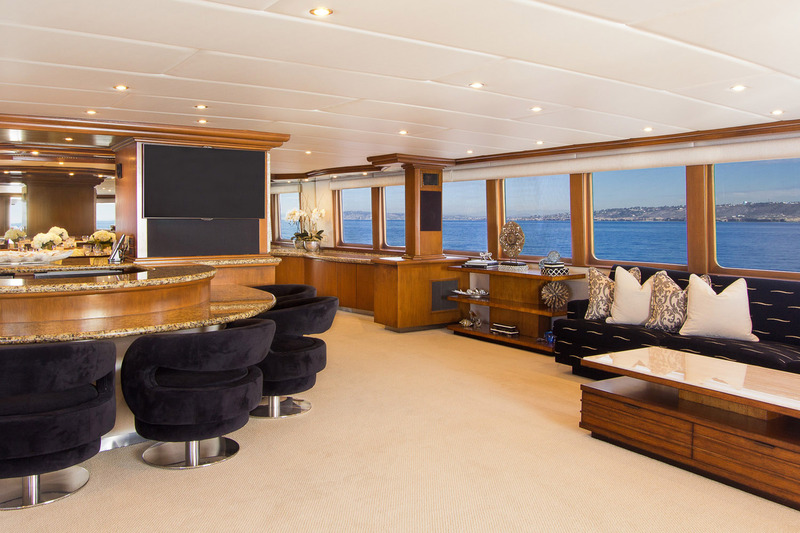 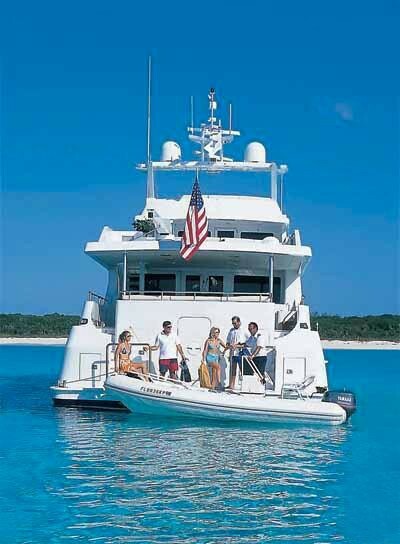 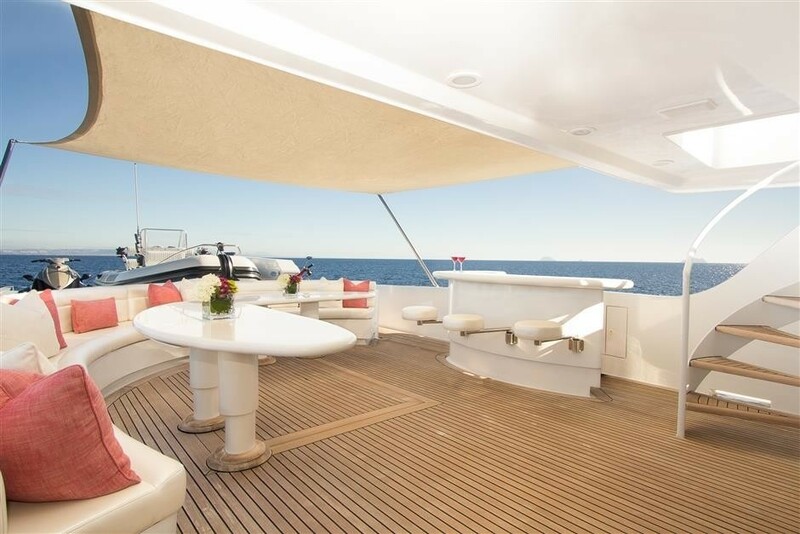 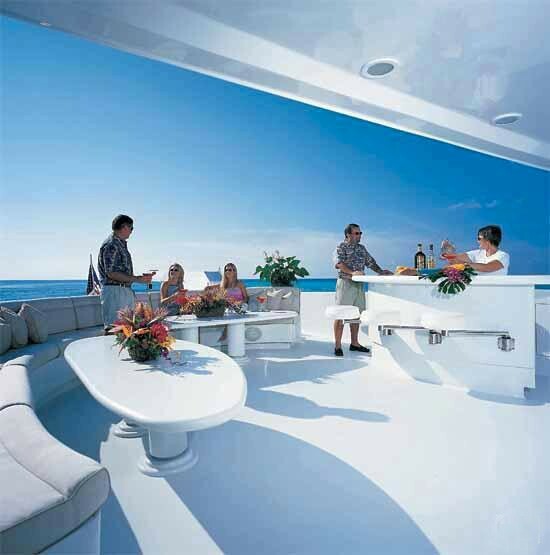 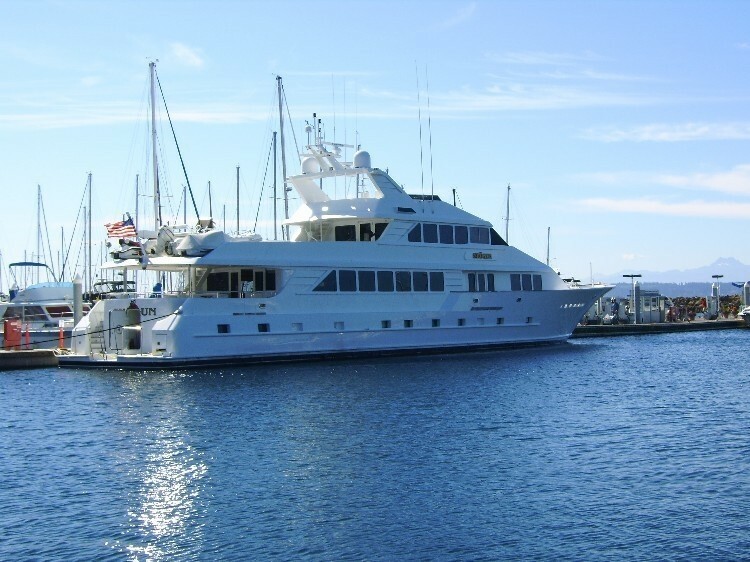 Sundeck: Full wet bar, refrigerator, ice maker, Jenn-Aire grill, barstool seating, casual dining, Flir - thermal camera on the mast for seeing at night Kaleidescape Communications: WIFI, VSAT, SatCom/SatFax,, VHF.